Barrett-Jackson returned to the Northeast for its second round June 22-24, 2017. A measure of the success of B-J’s foray into New England is the price of admission on Saturday: The same $75 that B-J charges for a Saturday ticket at its original Scottsdale auction at WestWorld. Spectator traffic may have been impeded by a line of storms that drenched the area early Saturday morning, but as the day cleared the venue packed in people matching the throngs on hand Thursday and Friday. 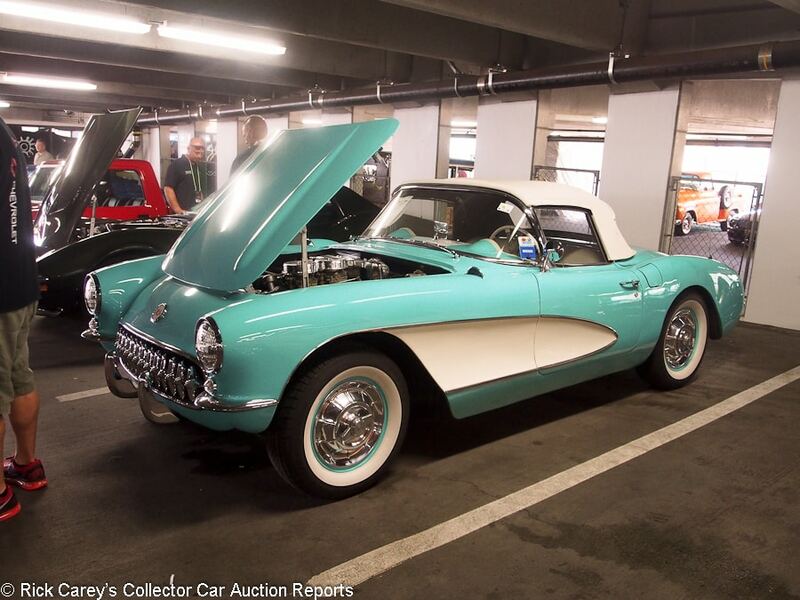 RestoMods, customs and modified cars saturated the auction docket, segments that B-J does well with and which onlookers enjoy. Prestone (they make more than antifreeze) sponsored a subsidiary stage in the lineup outside the auction arena where some cars were siphoned off on their way back to the preview displays. A rolling cast of commentators there addressed the cars with more information on their history, where they fit in car collecting and observations on their block results that added information for spectators and contributed another element to the B-J show and what it does to inform, enthuse and encourage interested onlookers to become collector car owners. 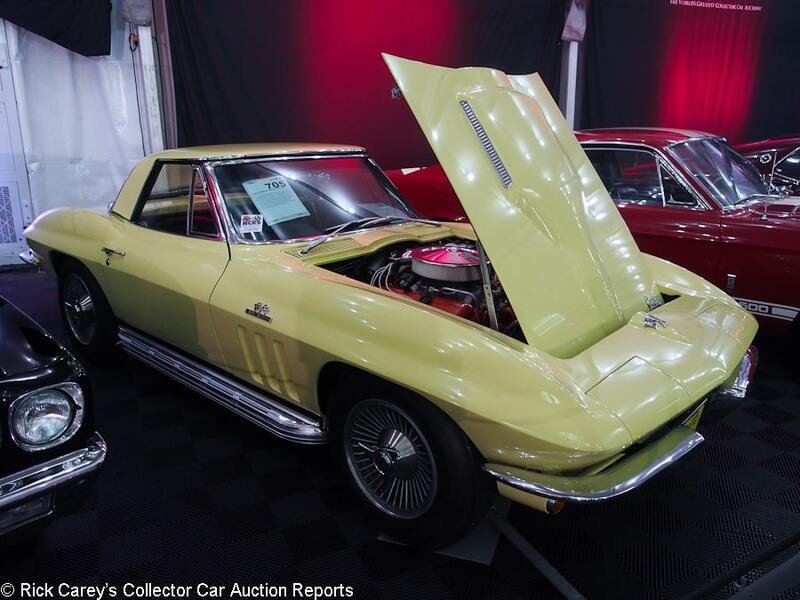 The auction brought in a little less than the inaugural year, a sale that had as its top seller a ’69 Corvette L88 at $624,800 all in. 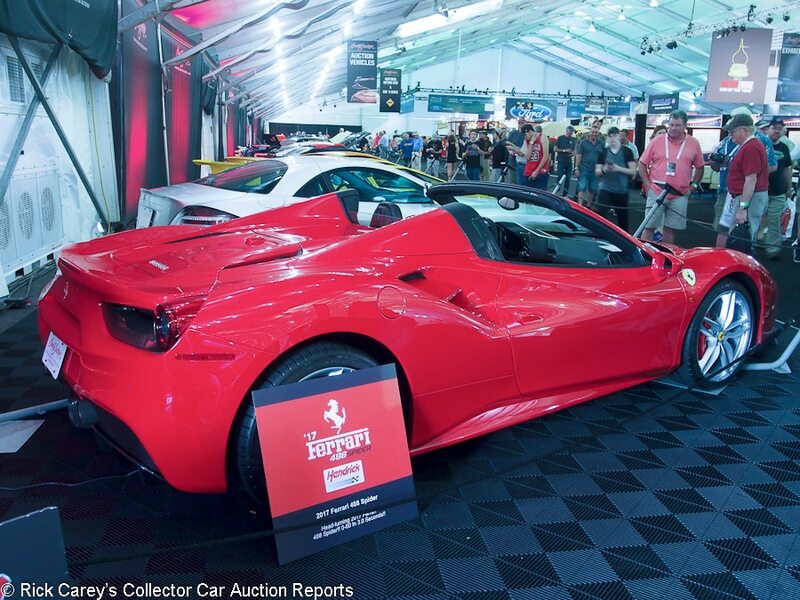 This year’s top sale was only [sic] $434,500 for a 2017 Ferrari 488 Spider. The docket was refined after last year’s experience to recognize what the Northeast bidders wanted, and they showed their agreement with some exceptional prices. Barrett-Jackson knows how to put on a show and the Mohegan Sun weekend is full of attractions in addition to the cars, from Dodge, Ford and Corvette thrill rides to an acre of exhibitors and one of the best food courts in auction history, all in addition to the myriad attractions of Mohegan Sun itself. It is a great way to spend three days and there is no shortage of interesting cars as the 60 or so that follow shows. The observed cars were done by me; Andrew Newton was in Santa Monica for the RM Sotheby’s (formerly Auctions America) sale at the Barker Hangar. Andrew’s report will follow shortly. 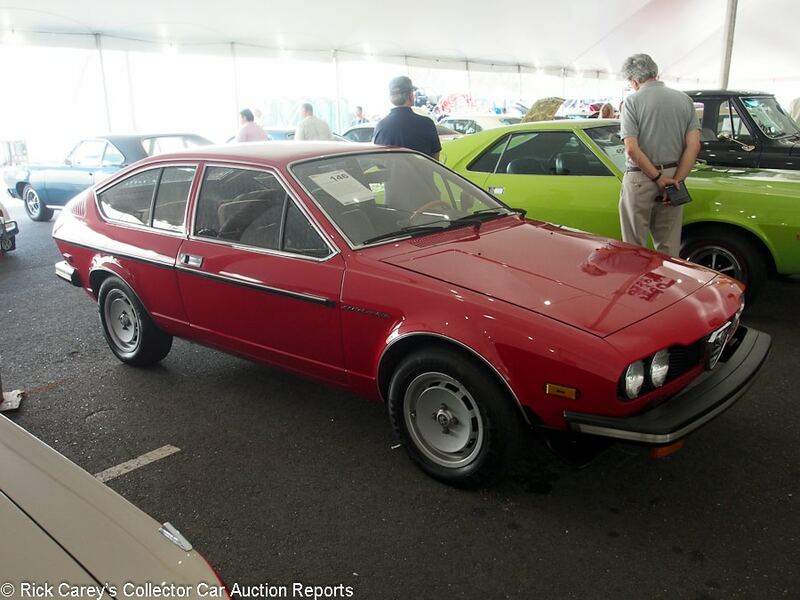 Lot # 146 1979 Alfa Romeo Alfetta Sprint Veloce; S/N AR116150006345; Red/Beige cloth; Visually maintained, largely original, 3 condition; Hammered Sold at $20,000 plus commission of 10.00%; Final Price $22,000. No Reserve. – Audiovox cassette stereo, alloy wheels, Pirelli P4000 tires, Ansa exhaust. – Fair, thick orange peely repaint. Dry underbody. Locked up. Represented as having one enthusiast owner in Seattle until recently and looks the part although it would have been better for the consignor to leave the engine accessible. – Bidding on this Alfa stalled on the Mohegan Sun block in low teens, then fired up again to end with this highly generous result. The originality is impressive, but its “pampered” history would have been better served either by a better quality repaint or simply leaving the original finish intact. As it is this result is generous by at least 25%. 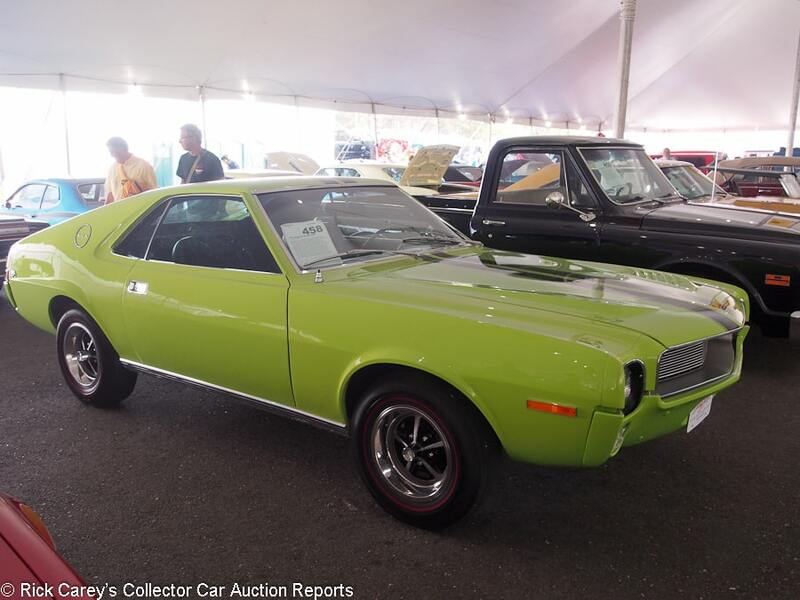 Lot # 458 1968 American Motors AMX 2-Dr. Hardtop; S/N A8C397T291829; Big Bad Green, Black stripes/Black vinyl; Modified restoration, 3 condition; Hammered Sold at $20,000 plus commission of 10.00%; Final Price $22,000. No Reserve. – 343 originally but a 360 now, automatic, power brakes, Twin Grip axle, Magnum wheels, red line tires, pushbutton radio, aftermarket tach. – Sound original upholstery, fair older repaint, good chrome except for pitted door handles. Painted bumpers. Underbody has received some attention but rusty fender supports have been put back on without being painted. A mediocre, modified driver. – The seller should be highly satisfied with this result but the buyer will be less so when the euphoria wears off and reality sets in. Modified cars are much less desirable, particularly when presented like this, and this result is highly generous. 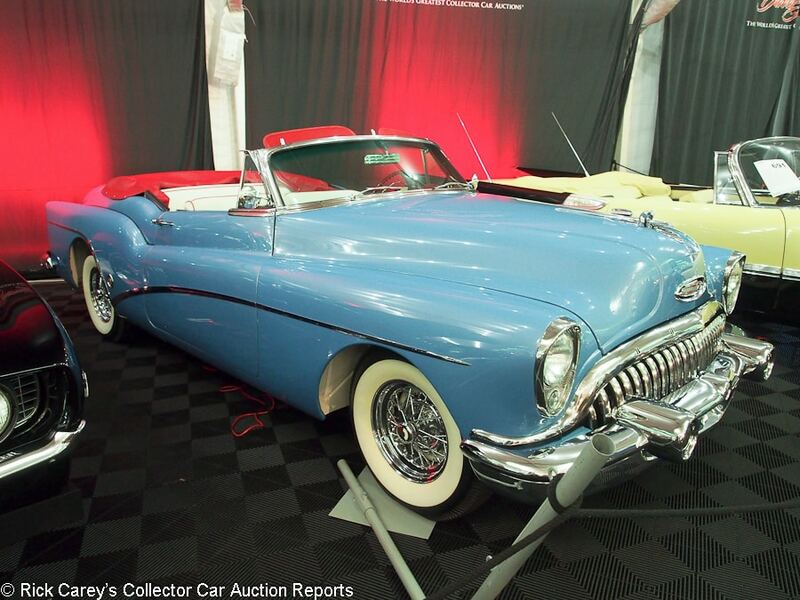 Lot # 683 1953 Buick Skylark Convertible; S/N 17144095; Reef Blue/White, Red leather; White vinyl top; Older restoration, 2- condition; Hammered Sold at $125,000 plus commission of 10.00%; Final Price $137,500. With Reserve. – 322/236hp, Dynaflow, power steering, power brakes, power windows, radio, heater, chrome wire wheels, wide whitewalls, power antenna. – Small touched up chips at the back edges of the hood. Small touched up chip on the trunk lid. Good panel gaps. Pretty much spotless underneath and in the engine compartment. Chrome and brightwork are very good. Very good interior. A beautiful car restored to very high standards, just done a while ago and enjoyed since. – Now here’s a surprise. This Skylark sold for $132,000 at Worldwide’s Scottsdale auction in January but unlike most collector cars that turn over quickly it has added 121 miles to the odometer since then: Someone has actually driven it. What a concept. The $5,000 difference in the successful hammer bid between here and there is insignificant and both were sound values. 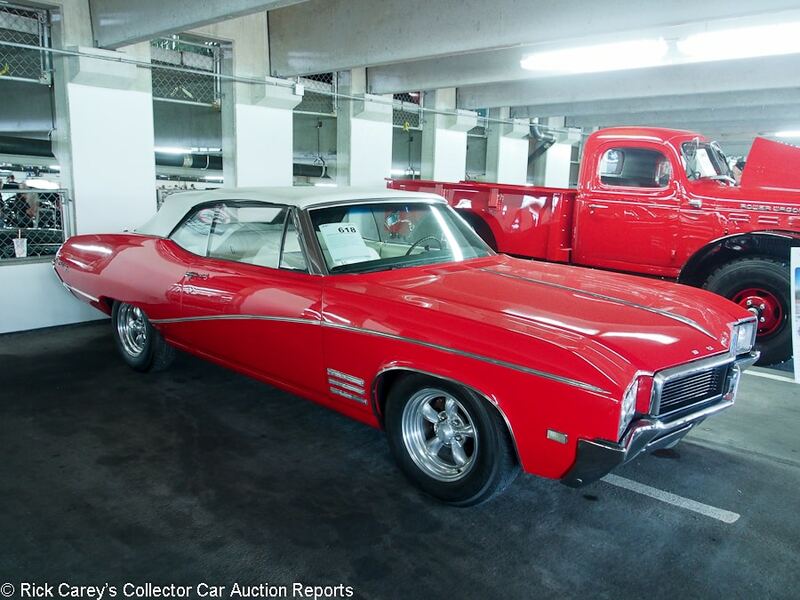 Lot # 618 1968 Buick Skylark Convertible; S/N 444678K120545; Red/White vinyl; White vinyl top; Modified restoration, 3 condition; Hammered Sold at $18,000 plus commission of 10.00%; Final Price $19,800. No Reserve. – 350 with a 4-barrel and dual exhaust, power steering, power brakes, air conditioning, power windows, bench seat, underdash gauges, Torque Thrust wheels, blackwall tires. – Pitted cast trim chrome. Fair repaint, uneven panel fits, good interior, lightly soiled top with frayed edges. Scratched right quarter window. Grungy dashtop at the bottom of the windshield. Orderly but used underbody. A mediocre driver. – The condition and modifications do this Skylark no favors, but it is an air conditioned convertible in “resale red” and that seems to have had the desired effect. Taking condition into account, it should have sold for no more than $15,000 hammer. The $3,000 more it brought here is not a lot of money, but is a 20% premium. 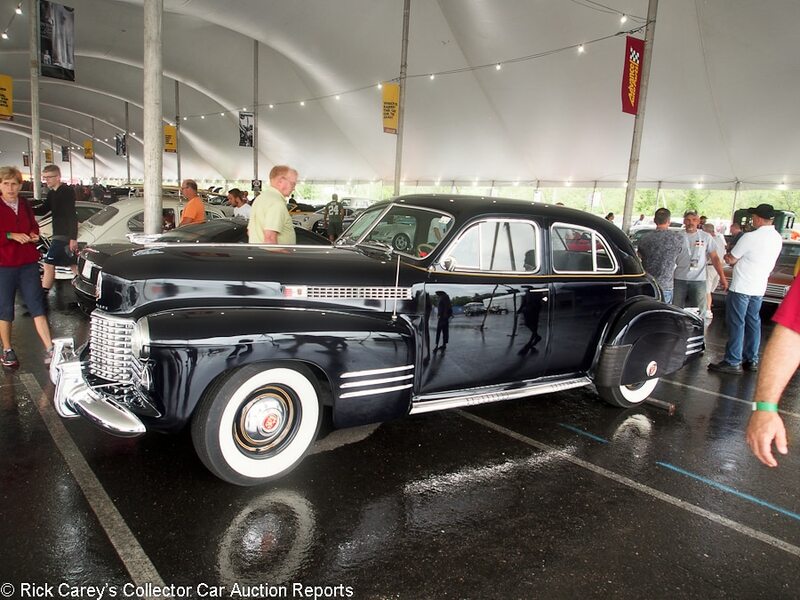 Lot # 341.1 1941 Cadillac Series 62 4-Dr. Sedan; S/N 8358024; Black, Gold coachline/Grey cloth; Older restoration, 3+ condition; Hammered Sold at $20,000 plus commission of 10.00%; Final Price $22,000. No Reserve. – 346/150hp, automatic, hubcaps, wide whitewalls, skirts, pushbutton radio, clock, grille guard. – Good older paint with small chips at the back of the hood. Very good chrome except for pitted side window trim. Very good interior and clean underbody. Delaminating side window glass. A surprisingly good example of a car that usually doesn’t get treatment like this. – There is room enough inside this monster to hold a party and the surroundings are pretty posh. It is a quality car, a CCCA Full Classic ™ and will never fail to attract positive attention, all for not a lot of money at all. 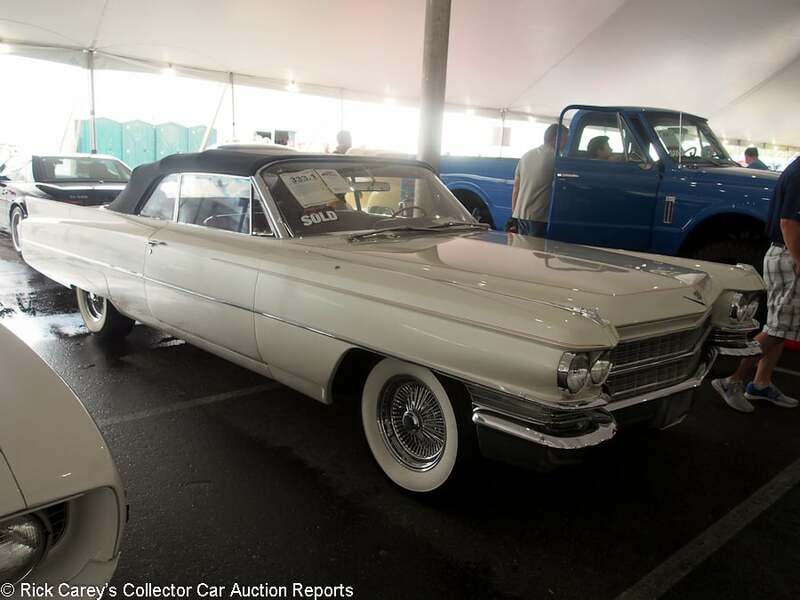 Lot # 333.1 1963 Cadillac Series 62 Convertible; S/N 63F138771; White, Red pinstriping/Dark Red leather; Black vinyl top; Cosmetic restoration, 3 condition; Hammered Sold at $40,000 plus commission of 10.00%; Final Price $44,000. No Reserve. – 390/325hp, automatic, chrome wire wheels, wide whitewalls, power bench seat, WonderBar radio, power steering, power brakes, power windows. – Good repaint, top, glass, interior and major chrome. Weak chrome on the side window trim and taillight bezels. The underbody is original and surface rusted. The chrome wire wheels are ugly. – This much money could have bought a better ’63 Series 62 convertible and the originality doesn’t come close to making up the difference especially when the expense of replacing these ugly wire wheels with standard wheels and wheel covers is factored in. 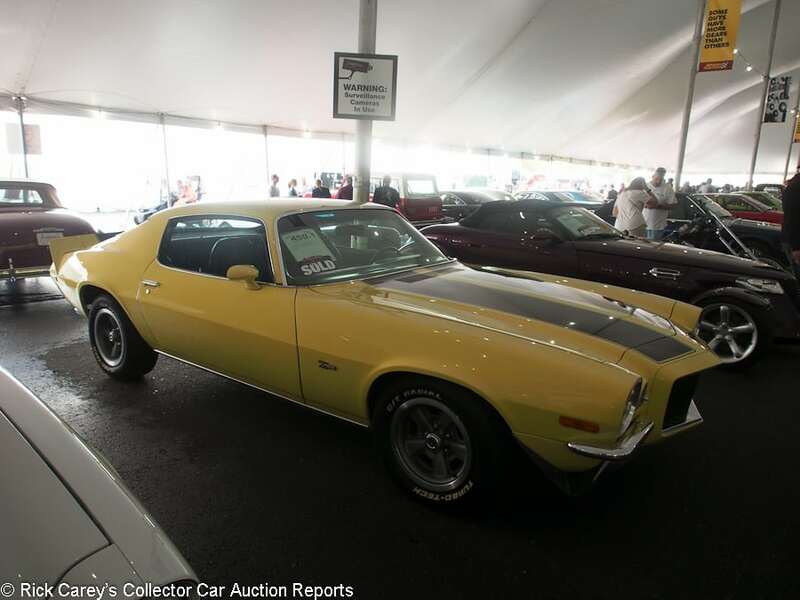 Lot # 450.1 1971 Chevrolet Camaro Coupe; S/N 124871N566453; Yellow, Black stripes /; Visually maintained, largely original, 3- condition; Hammered Sold at $25,000 plus commission of 10.00%; Final Price $27,500. No Reserve. – 327 of unspecified power, 4-speed, power steering and brakes, mag style wheels, air conditioning, off-brand tires. – Badged Z/28 but there is no evidence it actually is. Decent repaint except for rust bubbles behind the rear window and over the passenger’s door, sound interior. Door fit is fair; hood stands proud. The underbody is orderly and superficially repainted recently. A big, bright Yellow driver. – This is a generous result for a faux Z/28 with an odd engine under the hood and erratic presentation. It should have gone away for $10,000 less. Lot # 754 1967 Chevrolet Camaro SS 396 2-Dr. Hardtop; S/N 124377N225631; Engine # T0517MW 7N225631; Tahoe Turquoise, White nose band/White vinyl; Recent restoration, 2+ condition; Hammered Sold at $62,000 plus commission of 10.00%; Final Price $68,200. No Reserve. – 396/325hp, 4-speed, no power brakes or steering, Rally wheels, hubcaps, trim rings, red line tires, console gauges, AM-FM radio. – Freshly restored like new, obsessively documented and represented as the matching numbers engine, and transmission and rear end. – This is a generous price, but this also is an unusually comprehensively and meticulously restored Camaro with loads of documentation. The new owner car, even having paid lavishly for the car, feel unusual confidence in its quality even if “matching numbers” isn’t the functional equivalent of “original”. 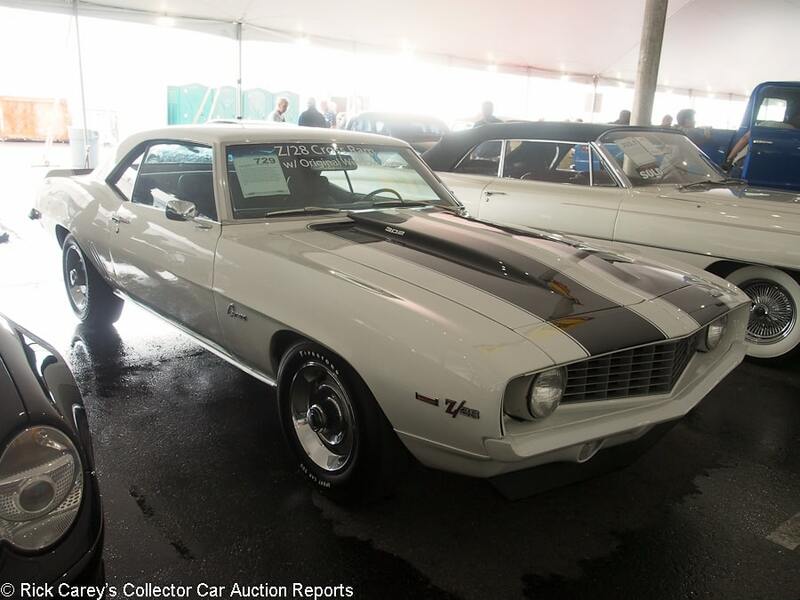 Lot # 729 1969 Chevrolet Camaro Z/28 2-Dr. Hardtop; S/N 124379N596807; White, Black stripes/Black vinyl; Recent restoration, 2 condition; Hammered Sold at $76,000 plus commission of 10.00%; Final Price $83,600. No Reserve. – 302/290hp with crossram dual quads, cowl induction, 4-speed, power steering, power brakes, Hurst shifter, Rally wheels with hubcaps and trim rings, Firestone Sport Car 500 tires, woodgrain steering wheel, radio delete. Window sticker documented. – Bowed hood, door bottoms hang out and the door gaps are wide. Very good paint, chrome and interior The underbody is like new, but with undercoat overspray on the wheelwell lips. Represented as having “a correct DZ-code 302ci engine”, not the same thing as the original engine. – Offered in January at Mecum’s Kissimmee auction where it was bid to $55,000, it reached a more appropriate price here at Mohegan Sun. It is suitably discounted for the undocumented, if appropriate, engine. The Crossram dual quad intake is free. 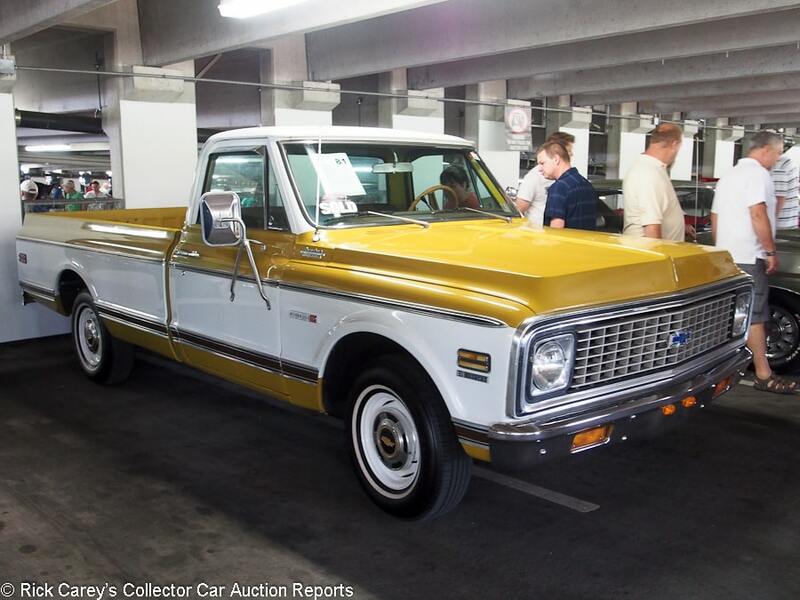 Lot # 81 1971 Chevrolet Cheyenne C10 Pickup; S/N CE141B637895; Gold, White/Saddle vinyl; Truck restoration, 3- condition; Hammered Sold at $16,000 plus commission of 10.00%; Final Price $17,600. No Reserve. – 350/250hp, automatic, power steering, power front disc brakes, pushbutton radio, hubcaps, narrow whitewalls, dual outside mirrors, heater, documented with the original build sheet, purchase order, Protect-o-Plate and owner’s manual. – Fair old repaint now dulling, chipped and scratched. Good interior. Variable chrome. Rhinolined bed side flanges. Chassis was done a while ago, and has been driven. A usable but aged and used truck restoration. – A neat little truck that is unusually well documented. It will look equally good at local shows, towing a float in parades or making runs to the lumber yard, especially at this moderate price. Lot # 707 1957 Chevrolet Corvette Convertible; S/N E57S100610; Engine # F1104EG; Cascade Green, White coves/White vinyl; White vinyl top; Older restoration, 3- condition; Hammered Sold at $87,000 plus commission of 10.00%; Final Price $95,700. No Reserve. – 283/270hp, 3-speed, WonderBar radio, spinner wheel covers, wide whitewalls. – NCRS judged 90.2 points in 2009. It has sat since.Represented as matching numbers. Sound older paint, chrome and interior. Newer lightly soiled top. The engine compartment and chassis are old, paint is flaking and dull. Now just a driver. – Sold by RM at Boca Raton in 2005 for $64,200, then at Ft. Lauderdale in 2007 for $70,200, it’s added 14,194 miles to the odometer in the last ten years, a classic Corvette that’s actually been driven more than a thousand miles a year. The miles show on the car, but it’s been taken care of and represents good value for the money even at this rather generous price. 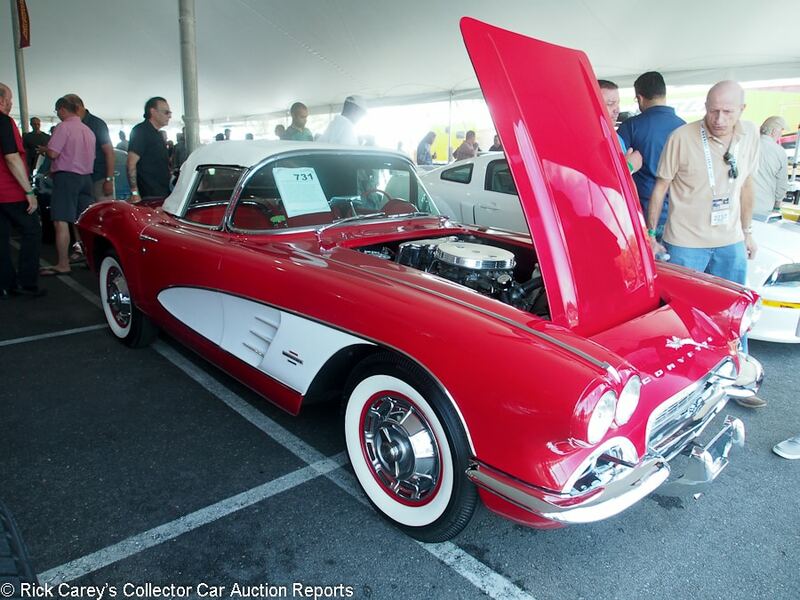 Lot # 731 1961 Chevrolet Corvette Convertible; S/N 10867S107927; Engine # 1107927 F0412CU; Red, White coves/Red vinyl; White vinyl top; Older restoration, 3 condition; Hammered Sold at $78,000 plus commission of 10.00%; Final Price $85,800. No Reserve. – 283/270hp dual quads, 4-speed, cassette stereo, spinner wheel covers, wide whitewall bias ply tires, power top. – Amazing pebble finish paint on all the red, but not the white. Good interior, dinged trim chrome. Orderly engine compartment with appropriately coded block but also stamped with the chassis number. Underbody has been done nearly like new a while ago. Top fits loosely. – The textured finish on this Corvette resembles the paint applied to early minicomputers and peripherals. In this case it’s an application flaw and even with the rare power top it must have been bought by someone in the last row of the Arena who hadn’t looked at it in the preview. Paint on a ’61 Corvette isn’t expensive, but it isn’t free and at this price is has to be more than free to make any sense at all. 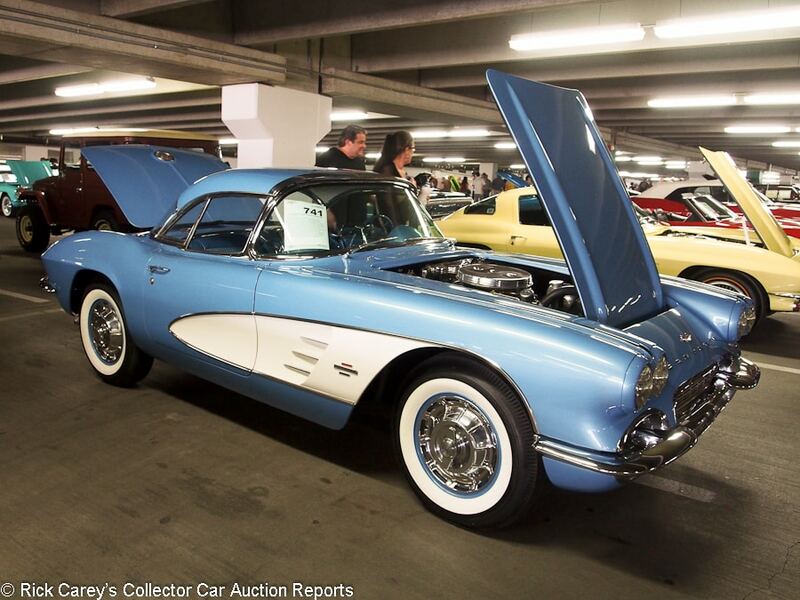 Lot # 741 1961 Chevrolet Corvette Convertible; S/N 10867S109254; Engine # F0715CU; Jewel Blue, White coves, Jewel Blue hardtop/Blue vinyl; White vinyl top; Older restoration, 2- condition; Hammered Sold at $69,000 plus commission of 10.00%; Final Price $75,900. No Reserve. – 283/270hp, dual quads, 4-speed, WonderBar radio, spinner wheel covers, whitewalls, two tops, power windows. – The engine compartment is fresh and like new. The underbody and chassis show age and some road miles. Paint, chrome and interior are very good. The inside of the hardtop windows could have been more thoroughly cleaned. A mellowed older restoration in an unusual color cleaned up for the auction. – The attention to the engine compartment as well as the dual quad engine and two-top equipment make this a desirable Corvette and it brought a representative price, particularly in the rare Jewel Blue color. 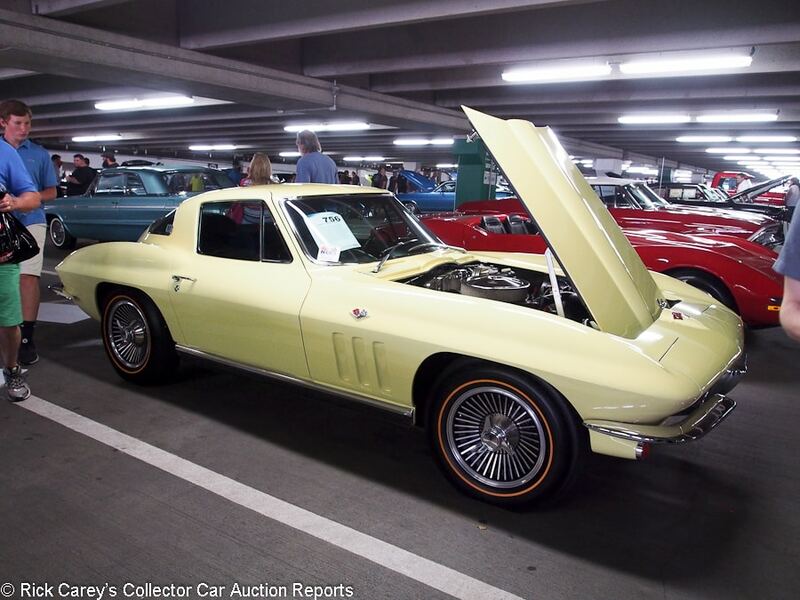 Lot # 756 1966 Chevrolet Corvette Coupe; S/N 194376S125793; Engine # 6125794 F0629HE; Sunfire Yellow/Black leather; Recent restoration, 2 condition; Hammered Sold at $56,000 plus commission of 10.00%; Final Price $61,600. No Reserve. – 327/300hp, 4-speed, power brakes, power steering, AM-FM, alloy wheels, gold line tires. – Represented as “a matching-numbers” engine with 71,299 miles from new. Excellent paint, chrome and interior. The engine and chassis are like new. An impressive, satisfying Corvette done just right and not overdone. Documented with the owner’s card, Protect-o-Plate, bill of sale and invoice. – Sold at Mecum’s Kissimmee auction in 2014 for $65,880. The mundane 300hp engine doesn’t commend this Corvette to avid collectors but is plenty powerful to keep up with traffic and won’t need constant attention. Both the seller and buyer should be satisfied with this result. 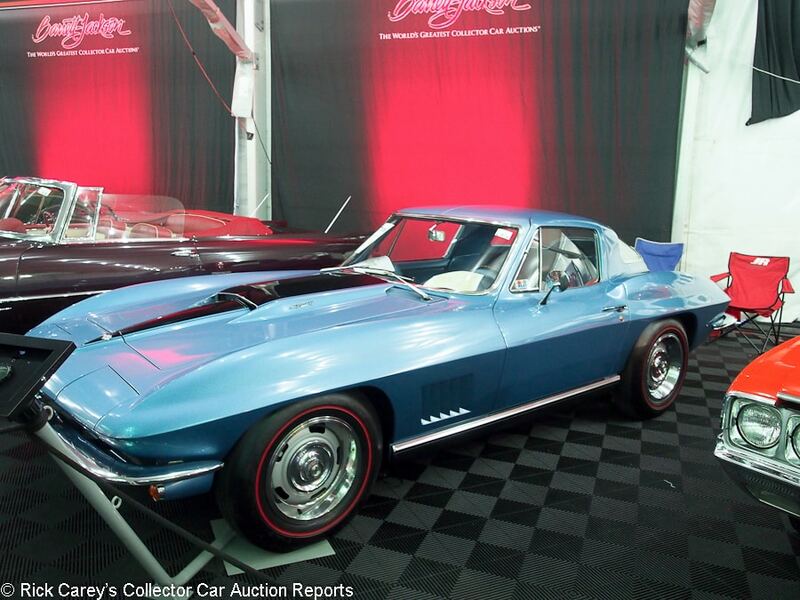 Lot # 727 1967 Chevrolet Corvette Coupe; S/N 194377S119763; Marina Blue, Black stinger/Blue vinyl; Older restoration, 2- condition; Hammered Sold at $70,000 plus commission of 10.00%; Final Price $77,000. No Reserve. – 427/390hp, 4-speed, air conditioning, side exhaust, AM-FM, Rally wheels with trim rings, red line tires, power brakes. – Very good paint, interior, glass and chrome. Driver’s door is an eighth of an inch off from closing flush; door and hood gaps are even. The underbody is not like new, but is more than good enough. Headlight doors have wide upper gaps and stick out a little from the nose. A sound Corvette, but with some faults that don’t fill bidders’ hearts with confidence. – Better than a “driver” but not a show quality Corvette, it’s the air conditioning that makes this Big Block coupe a good value at this price. A good body shop could remedy the panel fit issues, and that would make a big difference, but at this price why bother? 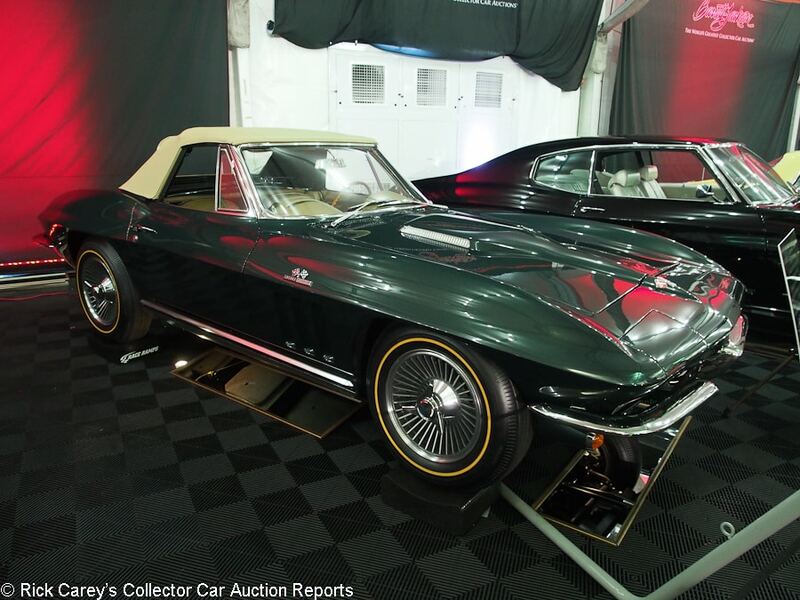 Lot # 679 1969 Chevrolet Corvette 427/435 Convertible; S/N 194679S705266; Engine # T1008LP 19S705266; Fathom Green, Fathom Green hardtop/Black vinyl; Black vinyl top; Unrestored original, 2- condition; Hammered Sold at $84,000 plus commission of 10.00%; Final Price $92,400. No Reserve. – LP-coded 427/435hp with L89 aluminum heads, M21 4-speed, 3.70 Positraction, transistor ignition, tilt steering column, both tops, AM-FM. – Very good clearcoated original paint and original interior. Represented as the original engine and drivetrain and 48,313 miles. Bloomington Gold. 2004 NCRS Top Flight. Not like new but could come close after being cleaned up and detailed especially under the hood. Exhaustively documented, known ownership history with a chain of titles from new. – Crossed the block at Mecum’s Spring Classic last month where it was reported bid to $90,000. Sold for a few dollars less here, aside from the very good condition the pile of documentation is highly unusual and suggests it has never been neglected or fallen into disrepair. The result here is modest for a car that could have brought over $100,000 without being excessive. 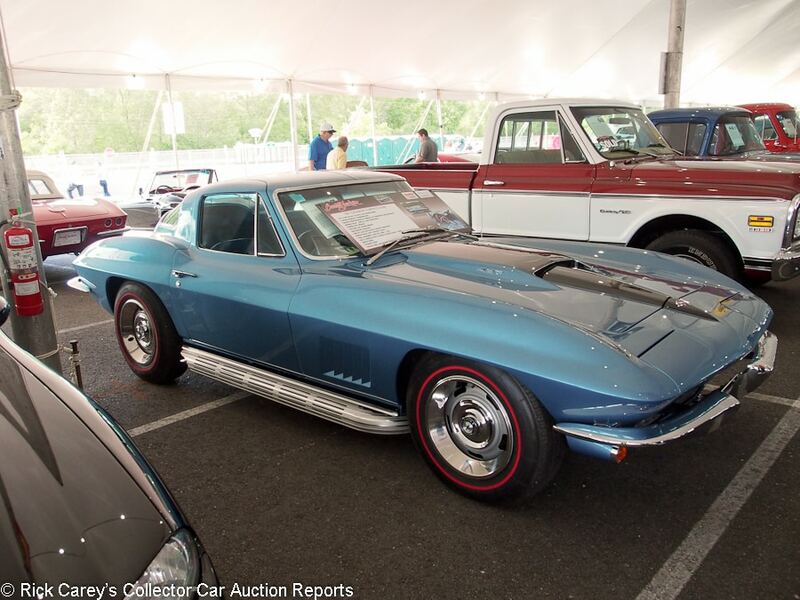 Lot # 706 1967 Chevrolet Corvette 427/435 Coupe; S/N 194377S117476; Engine # T0404JE 7117476; Marina Blue, Black stinger/Blue vinyl; Older restoration, 2 condition; Hammered Sold at $210,000 plus commission of 10.00%; Final Price $231,000. With Reserve. – 427/435hp, 4-speed, Rally wheels with trim rings and hubcaps, red line tires, AM-FM. 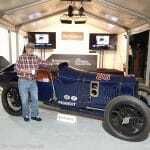 – Bloomington Gold, NCRS Top Flight, Duntov Award. Thoroughly documented and restored with a wonderful lacquer paint job that looks like it came from St. Louis. It’s impossible to tell it’s aged original or restored this way, but either way it’s a marvelous Corvette. – The consignor was in attendance by this Corvette and was open, informative and about as enthusiastic as any collector car owner can be. It was for sale to make room in his garage for a more original example he’d been chasing for years. His commitment to the car and the multiple awards it had earned showed in the price it brought. It is expensive by most standards but the new owner takes over with a high level of confidence in its quality. The paint, original in its appearance, is a bonus. 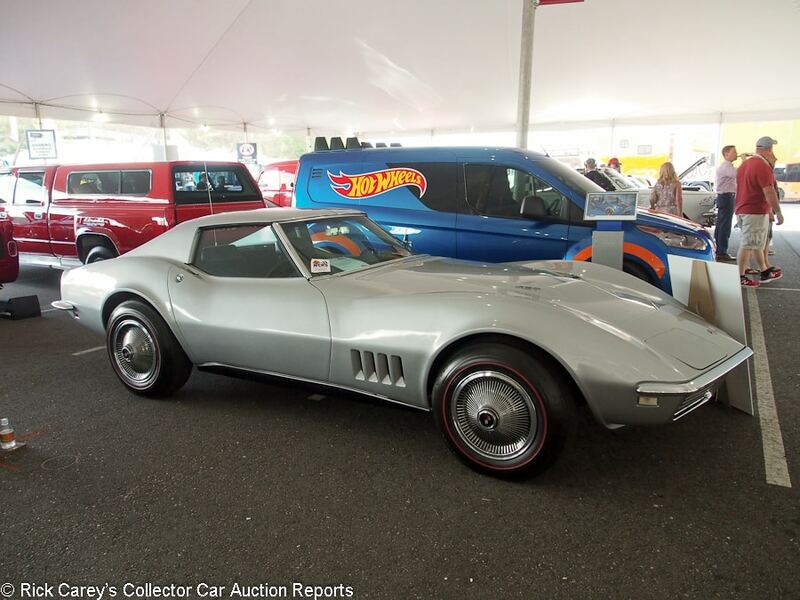 Lot # 719 1968 Chevrolet Corvette 427/435 L89 Coupe; S/N 194378S414173; Silver/Black vinyl; Unrestored original, 2- condition; Not sold at Hammer bid of $99,000. With Reserve. – 427/435hp L89 aluminum heads, 4-speed, transistor ignition, power brakes, power steering, AM-FM, tee-tops, wheel covers, red line tires. – 20,934 original miles, original driveline, Bloomington Gold Survivor and Benchmark. Dull original paint, good chrome and interior. Rear bumper chrome is starting to peel. Dry, original, dirty underbody. As good as its awards indicate. – Bid to $90,000 at Mecum’s Spring Classic a month ago, the bidders don’t seem to be responding to its originality or its L89 configuration. The consignor some day will run out of places to try to find just the right bidders but these two results make a strong case that just under $100K is right money for its configuration and originality. Lot # 705 1966 Chevrolet Corvette 427/450 Roadster; S/N 194676S102379; Engine # F0922IP 6102379; Light Yellow, Light Yellow hardtop/Black vinyl; Black vinyl top; Recent restoration, 2 condition; Hammered Sold at $140,000 plus commission of 10.00%; Final Price $154,000. With Reserve. – 427/450hp, 4-speed, power steering, power brakes, side exhaust, centerlock alloy wheels, blackwall (non-DOT) tires, AM-FM, woodrim steering wheel, tilt steering column, F41 suspension, power antenna, two tops. – 2017 NCRS regional judged 99 points and looks like it with everything presented in showroom condition. Represented as the original engine. – Chevy rated its first 7-liter at 450hp upon introduction, later cutting back to 425hp as the product planners anticipated the 3×2 435 for 1967 and the lawyers responded to insurance company complaints. It is blissfully powerful, however and this one is blissfully presented without apparent flaw and brought a price that reflects its specifications, the quality of its restoration and its equipment. Lot # 364 1964 Chevrolet Impala 2-Dr. Hardtop; S/N 41447T241585; Engine # 241585 T0122QQ; Ice Blue/White vinyl; Cosmetic restoration, 3- condition; Hammered Sold at $30,000 plus commission of 10.00%; Final Price $33,000. No Reserve. – 409/340hp, 4-speed, power brakes, power steering, pushbutton radio, spinner wheel covers, narrow whitewalls, dash mounted tach, buckets and console, SS trim. – Poorly restamped VIN on the block, but accurate engine stamping. No representation of the engine’s originality. Good older paint, chrome and interior. Orderly but oily engine compartment and unrestored but dry chassis and underbody. Edge chipped doors. Pitted window trim. A usable but not impressive cosmetically restored driver. – Nowhere does the seller claim this is the original engine, or even if it came with a 409 from the factory, and it has been given a quick cosmetic redo consistent with an engine change. The bidders discounted it heavily here in Uncasville, but even this price is much more than the $19,800 it sold for at Worldwide’s Dallas auction two months ago. 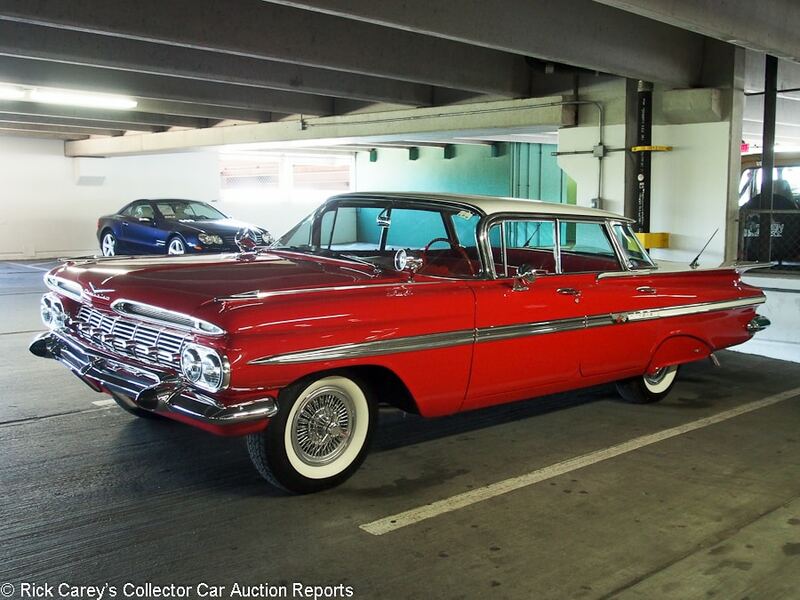 Lot # 624.1 1959 Chevrolet Impala 4-Dr. Hardtop; S/N F59L166387; Red, White roof and rear deck/Red vinyl; Enthusiast restoration, 2- condition; Hammered Sold at $26,000 plus commission of 10.00%; Final Price $28,600. No Reserve. – 283/185hp, Powerglide, underdash Arc 2500 45 rpm record player, pushbutton radio, heater, door handle shields, sill moldings, wire wheel covers, dummy spotlights, whitewalls, skirts, grille guard. – Good paint, interior, glass and chrome. Uneven hood and door fits. Done underbody. Garish, but will not be overlooked. – What a presence! It’s hard to convey the effect this bright red and white flattop roof Sport Sedan had as it drove through the crowds at Mohegan Sun. All eyes were on it, and it literally stopped people in their tracks. There is nothing special about it, except the load of optional equipment fastened to it. 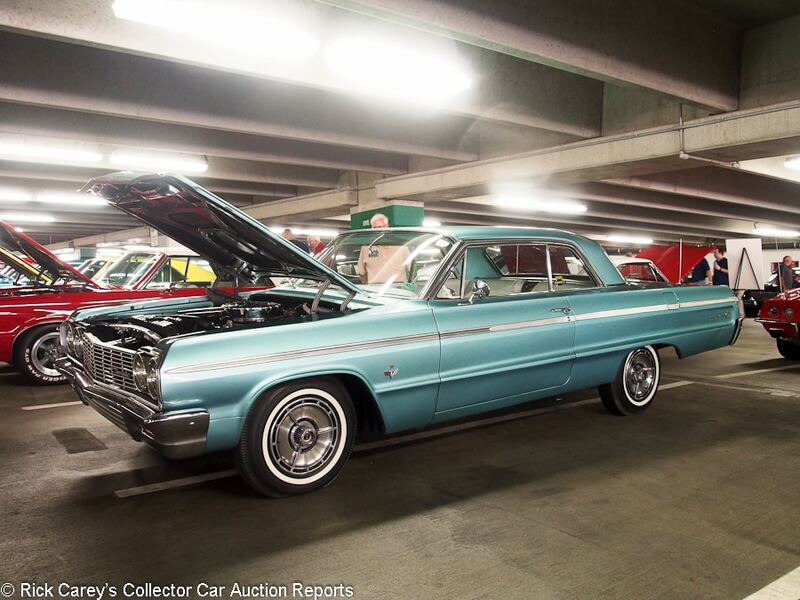 Ordinarily a similar Impala Sport Sedan would be worth $20,000, but there is no denying the effect this car had, nor is it reasonable to criticize the bidders’ determination to own it even at this price. 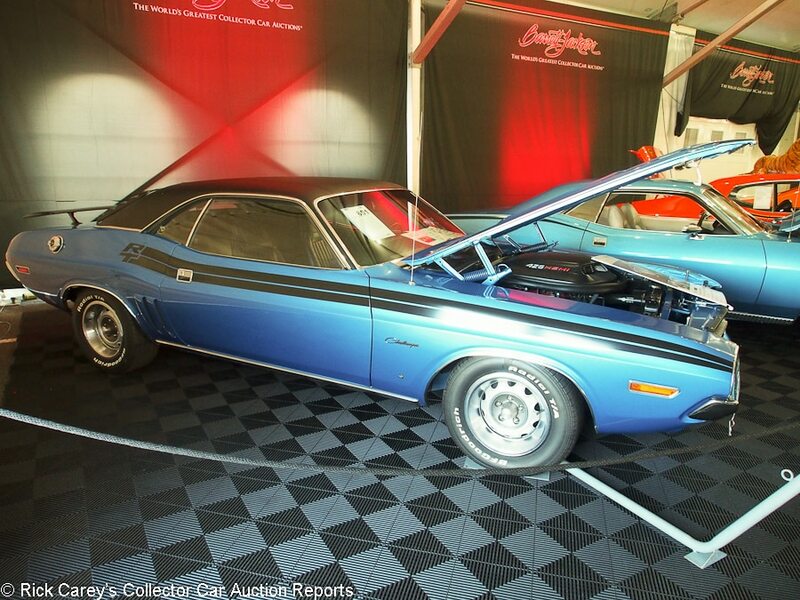 Lot # 651 1971 Dodge Challenger R/T Hemi 2-Dr. Hardtop; S/N JS23R1B375721; Blue, Black vinyl roof/Black vinyl; Older restoration, 2- condition; Not sold at Hammer bid of $165,000. With Reserve. – 46/425hp Hemi, 4-speed, power steering, power brakes, shaker hood, pushbutton radio, gauges, Rallye wheels, trim rings, Radial T/A tires, rear window slats, wing, woodgrain steering wheel, no console. – Represented as the original engine, transmission and rear end. Good older paint, chrome and interior. Bird poop spot on the roof. Very good door and trunk fits. The top of the engine is neat and clean but the bottom is dirty and oily. Dusty underbody and wheel wells. A quality older restoration with age and miles. – There were obviously shortcomings in the presentation of this Hemi Challenger, but not enough to induce the consignor to let it go at the reported high bid. It should have brought more like $190,000 even in its present condition, with the added benefit that it can be driven without seriously compromising its condition or value. Lot # 691 1959 Dodge Custom Royal Lancer Super D-500 Convertible; S/N M352106156; Yellow, Black/Yellow vinyl, Black cloth; Black cloth top; Older restoration, 2- condition; Hammered Sold at $200,000 plus commission of 10.00%; Final Price $220,000. With Reserve. – 383/345hp, dual quads, automatic, power steering, power brakes, spinner wheel covers, wide whitewalls, dual rear antennas, split front power seat, pushbutton radio. – Very good older paint, chrome and interior. The engine compartment was restored like new and now shows a little age and some fuel leakage on the valley cover. The restoration was mechanically freshened and road tested earlier this year. The underbody is better than new. A quality older restoration holding up very well. – A prodigious automobile, but it brought an even more prodigious curve-setting price. It has a dramatic presence and is deliciously embellished with chrome gew gaws. It’s a traffic-stopper. It’s also very expensive at this price, but it will attract far more attention than a Hemi Challenger at four times more. 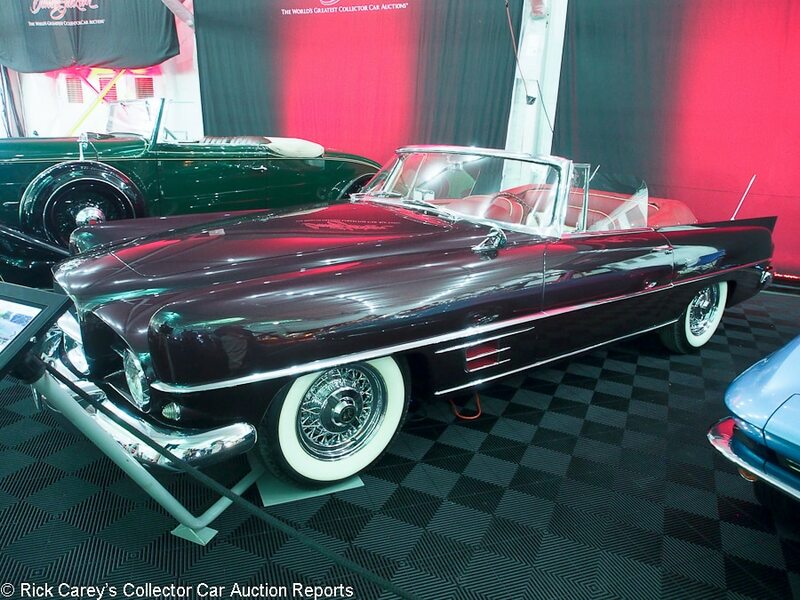 Lot # 699 1958 Dual Ghia DG Convertible; S/N 191; Eggplant/Red, Cream leather; Black top; Older restoration, 2- condition; Hammered Sold at $245,000 plus commission of 10.00%; Final Price $269,500. With Reserve. – 315/230hp Hemi, PowerFlite, dual antenna, wire wheels with spinner wheel covers, Goodyear whitewalls, power steering, power brakes, power windows, red leather boot cover, special delivery plaque on the dash, Benrus clock in the steering wheel. – Lightly run but tidy restored engine bay. Passenger’s side door doesn’t quite fit flush. Very good interior. Very good paint. Restored a while ago, but the work was quality and the car has been babied since. 107th of 117 built. 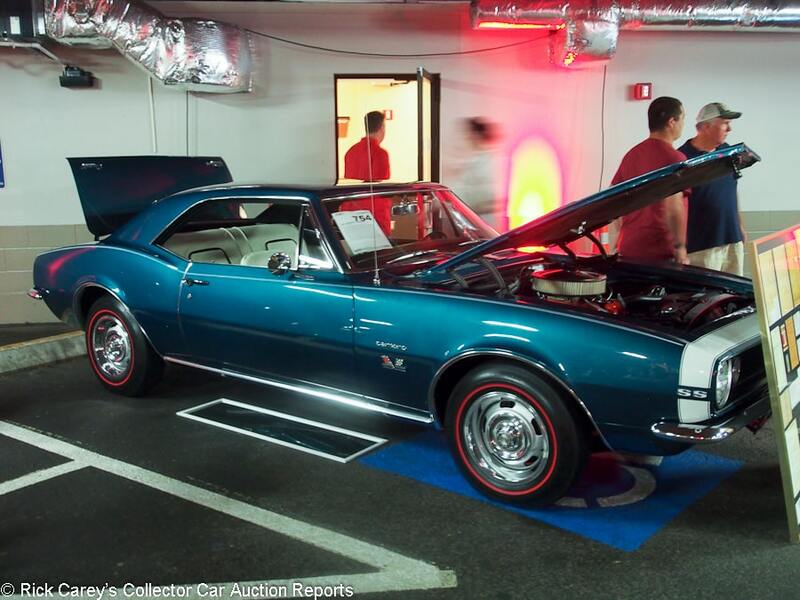 – Sold by Auctions America at Ft. Lauderdale in March of 2015 for $225,500, the interior has since been redone in red and cream leather that impressively plays off the Eggplant exterior. It had its desired effect on the bidders at Bonhams Quail Lodge auction five months later, bringing a well over low estimate price of $368,500 that qualifies as expensive. It returned to earth here in Uncasville with a result that is responsible and realistic. It got serious attention in the preview where most of the onlookers wondered what it was, but appreciated its style and design. The new owner should appreciate the intelligent price paid for it. Lot # 657 2017 Ferrari 488 Spider; S/N ZFF80AMA3H0221424; Red/Black leather; Unrestored original, 2 condition; Hammered Sold at $395,000 plus commission of 10.00%; Final Price $434,500. With Reserve. – Manettino steering wheel, SSC traction control, SCM3 magnetic suspension damping, carbon-ceramic brakes, Daytona-style leather seats, AFS suspension lifting system and carbon-fiber components. – New car with 77 miles. – Retail price paid for instant gratification. 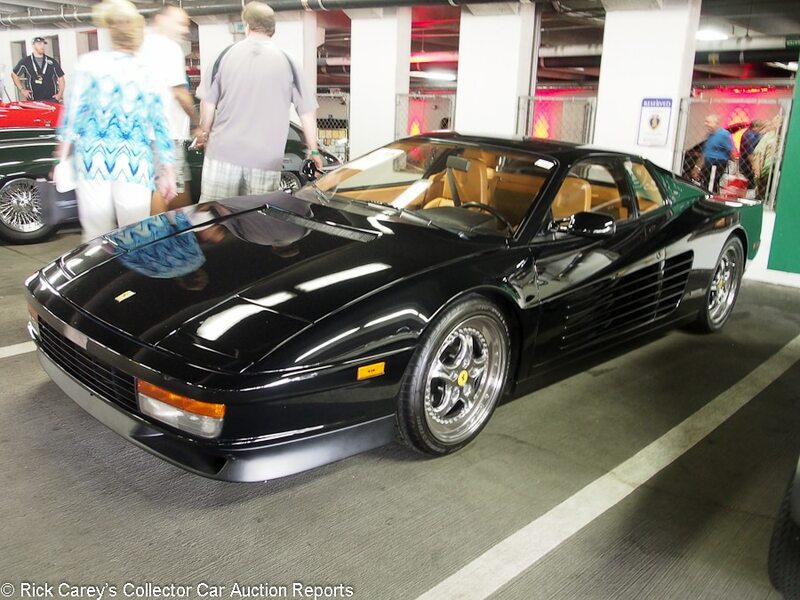 Lot # 725 1990 Ferrari Testarossa Coupe, Body by Pininfarina; S/N ZFFSG17A0L0087252; Black/Tan leather; Unrestored original, 2- condition; Hammered Sold at $77,000 plus commission of 10.00%; Final Price $84,700. No Reserve. – Chrome modular wheels, Bridgestone tires, Borla exhaust. – Major service in 2012, five years ago. Represented as 41,329 miles from new. Very good original paint and lightly stretched upholstery. Clean original underbody. – Sold by B-J in Las Vegas four years ago for $77,000, the buyer here added the commission to that result, which isn’t egregious. Lot # 371 1971 Fiat Nuova 500 Jolly Custom, Body by Ghia; S/N 6066101; Engine # 110F0006145585; Light Blue/White vinyl; White, Blue striped vinyl top; Recent restoration, 2- condition; Hammered Sold at $39,000 plus commission of 10.00%; Final Price $42,900. No Reserve. – Custom “Jolly” embroidered seats, brushed tube bumpers and side rails. – Good paint and surrey top, better upholstery. Sloppily drilled engine compartment vent panel. Orderly, clean engine compartment and chassis. Done to a price, but done. 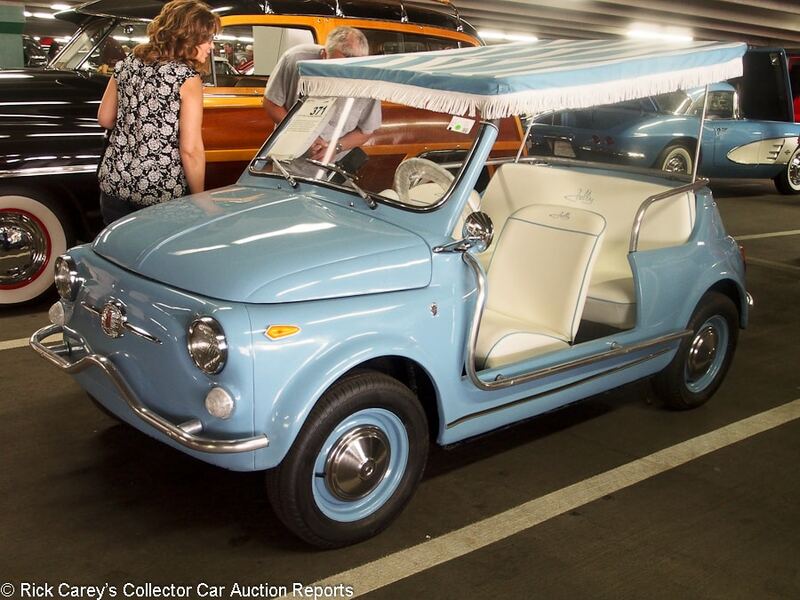 – The car card said this 500 Jolly has “a rebuilt 500cc 4-cylinder engine” but two of them have gone missing since it was sold at Auctions America’s Ft. Lauderdale sale ten weeks ago for $34,100. In other words, it has the correct opposed 2-cylinder 500 engine. It brought a bit more here at Mohegan Sun, but Jolly prices have a habit of jumping wildly around depending upon the whims of the audience and these upholstered seats will be more comfortable than the usual wicker. It is expensive, but not extravagantly so. 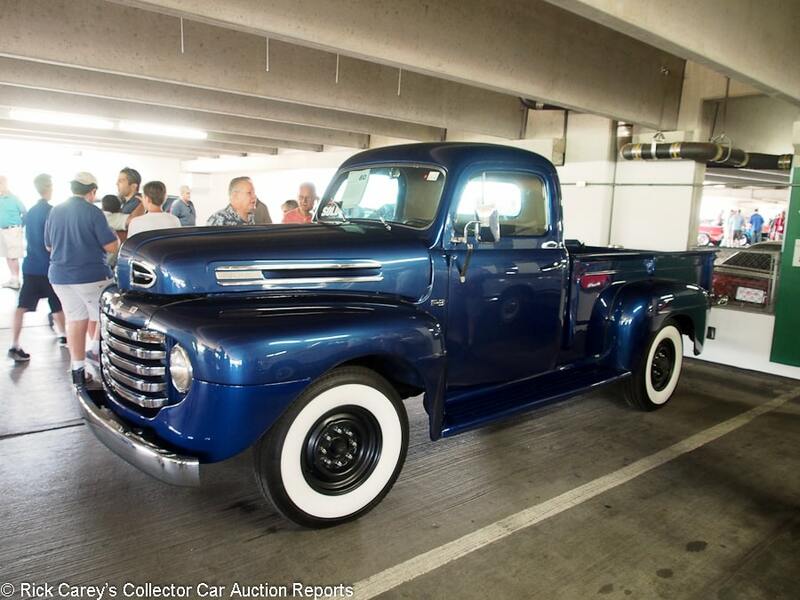 Lot # 80 1950 Ford F-3 Pickup; S/N 97HY242224; Metallic Blue/Brown vinyl; Truck restoration, 3+ condition; Hammered Sold at $20,000 plus commission of 10.00%; Final Price $22,000. No Reserve. – 226/90hp 6-cylinder, overdrive 3-speed, 16 inch 8-bolt wheels, wide whitewalls, turn signals, dual outside mirrors, chrome bumpers, stained and varnished oak bed floor, power steering added and 12 volt converted. – Scratched repaint touched up with another color, sound interior. Erratic chrome. Chassis and underbody were done, then driven. A pickup quality restoration that has been used as a pickup. – This is definitely a working truck and it received a superficial working truck restoration that hasn’t been babied since it was done. It is, however, an F-3 and while there were 20,000+ built few survive which may account for this generous price. 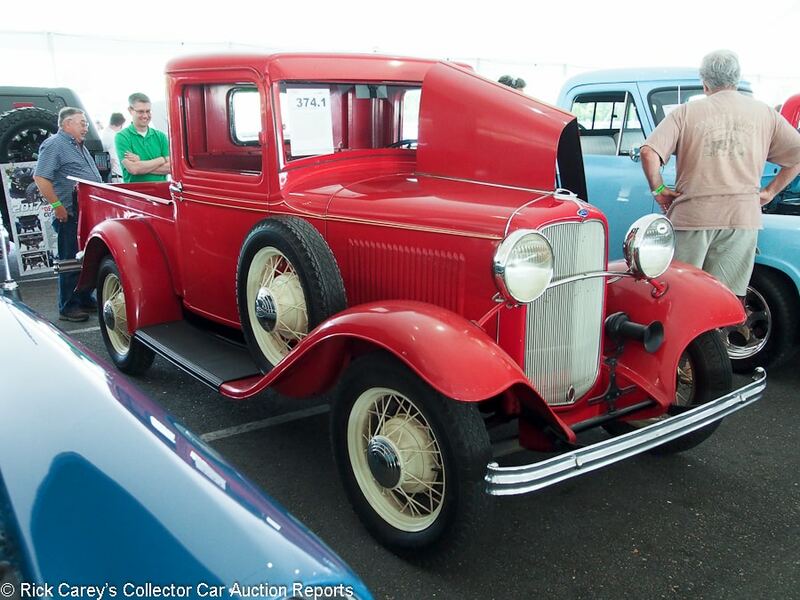 Lot # 374.1 1932 Ford Model B Pickup; S/N B5163315; Red/Red vinyl; Visually maintained, largely original, 3+ condition; Hammered Sold at $31,000 plus commission of 10.00%; Final Price $34,100. No Reserve. – 201/50hp 4-cylinder, 3-speed, Cream wire wheels, blackwall tires, single sidemount. – Dull, scratched but sound old repaint, decent old chrome, sound interior in an inappropriate pattern material. Orderly engine compartment with new wiring. Good gauges; cracked steering wheel hub. Painted wood bed floor. A remarkably sound California truck with an old repaint and replaced upholstery but otherwise impressively original and preserved. – This is a remarkably original truck that seems never to have been used for hauling anything more than driver and passenger. It is sound everywhere and aside from the mediocre old repaint is in very good condition. 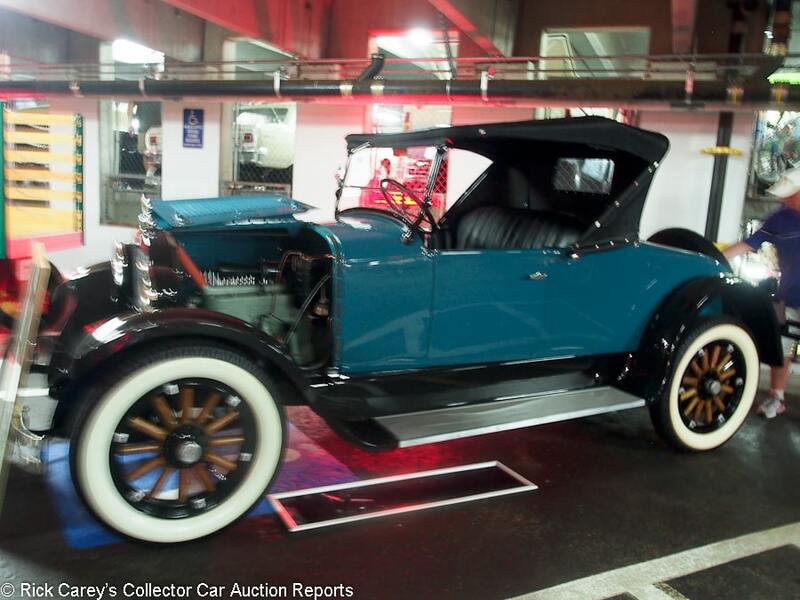 Unfortunately it didn’t run and had to be towed across the block, which is not good, but that doesn’t seem to have deterred the bidding and it brought a price that is no less than appropriate. It has many possibilities and the new owner will get a lot of enjoyment out of it at this price. 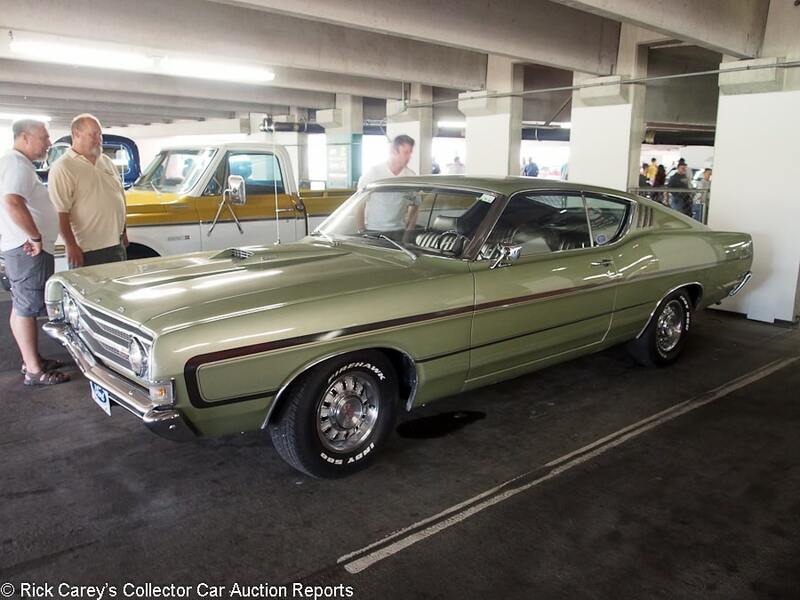 Lot # 619 1969 Ford Torino GT Fastback; S/N 9A42M230003; Lime Gold/Green vinyl; Older restoration, 3- condition; Hammered Sold at $19,500 plus commission of 10.00%; Final Price $21,450. No Reserve. – 351/290hp, 4-speed, Hurst T-handle shifter, bench seat, Sun Pro steering column tach, sport steel wheels with hubcaps and trim rings, Firehawk tires, Panasonic cassette stereo. Marti Report, warranty plate and window sticker copy documented. – Represented as the matching numbers engine. Uneven deck lid and door fits. Restored chassis and underbody with subsequent miles. Pitted sail panel and quarter window trim chrome. A sound and unusual driver with some oversights and use. – This is an intriguing example typical of Ford’s “Total Performance” campaign in the late 60’s. It doesn’t have the tire-smoking big block that brings big money but will acquit itself well on the street or highway. The documentation suggests a car that never was neglected, as does its appearance and the matching numbers. This price is realistic for this car but the fun factor is much higher than the additional $20,000 that a 428 CJ would cost. 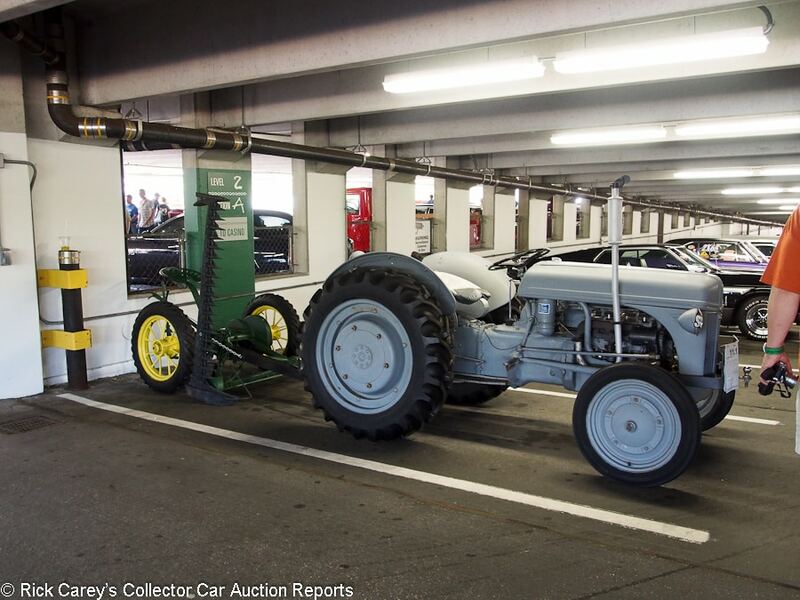 Lot # 11.1 1941 Ford Ferguson 9N Tractor; S/N Engine number; Engine # 9N101066; Grey/Grey; Truck restoration, 3- condition; Hammered Sold at $4,000 plus commission of 10.00%; Final Price $4,400. No Reserve. – Sickle bar towed mower, power takeoff, Ferguson implement mount, front-mounted tow ball. – Dull, tired paint, surface rust under chips. Tired but complete and practical. The towed converted horse drawn mower is John Deere green and yellow. – This is a sound but aged example of a working tractor that has survived surprisingly well. It is practical as well as unusual and restoration is as simple as masking off some working parts, steam cleaning the rest and spraying on a coat of Ferguson Ford grey. The Ferguson quick acting implement mount is still a practical and useful feature. It didn’t exactly get bidders’ juices flowing at Mohegan Sun, and this is a sound value whether for display or for chores around the farm. 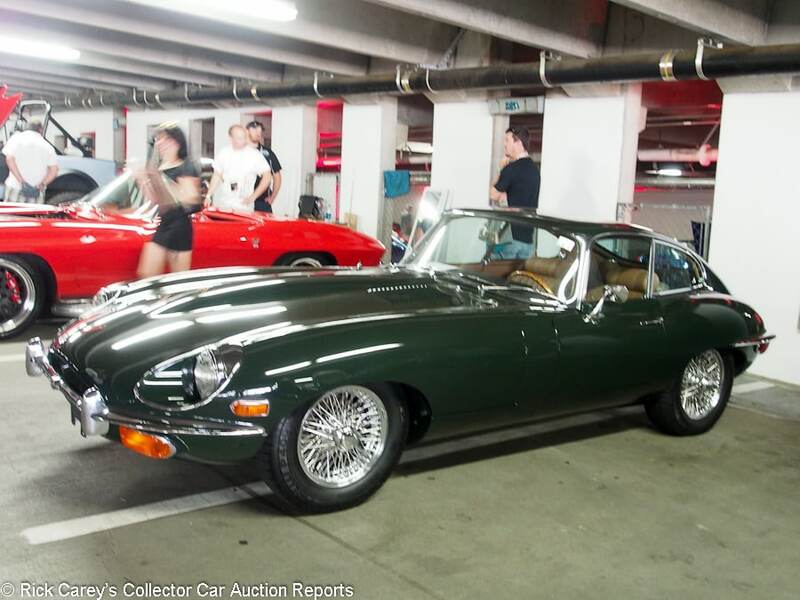 Lot # 370 1970 Jaguar XKE SII Fixed Head Coupe; S/N P1R28035; BRGeen/Tan leather; Modified restoration, 3+ condition; Hammered Sold at $68,000 plus commission of 10.00%; Final Price $74,800. No Reserve. – Chrome wire wheels, Pirelli P4000 blackwalls, Becker Europa AM-FM. – A 20,065 mile E-Type, lightly modified during restoration with triple SU carbs, adjustable shocks and stainless steel exhaust and brakes. Very good paint, chrome, interior and gauges. The rear hatch is slightly twisted. The engine and underbody are clean and nearly like new, not overdone. 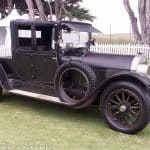 – Sold in the same condition, and with virtually the same miles, at Bonhams Quail Lodge auction in 2014 for $55,000, a sound value at the time but generous today unless someone is seriously intrigued by the upgrades for use on tours and events. Lot # 688 1988 Lamborghini Countach 5000 Quattro Coupe; S/N ZA9CA05A2JLA12218; Yellow/White leather; Visually maintained, largely original, 2- condition; Not sold at Hammer bid of $275,000. With Reserve. – Wing, rear view camera. – Repainted assembled over some small chips and cracks. Good original interior. The underbody is dry, with some old road dirt. A car that has sat and is showing only 13,891 km on the odometer. Claimed to have an engine-out service 500 miles ago, which was probably a decade. 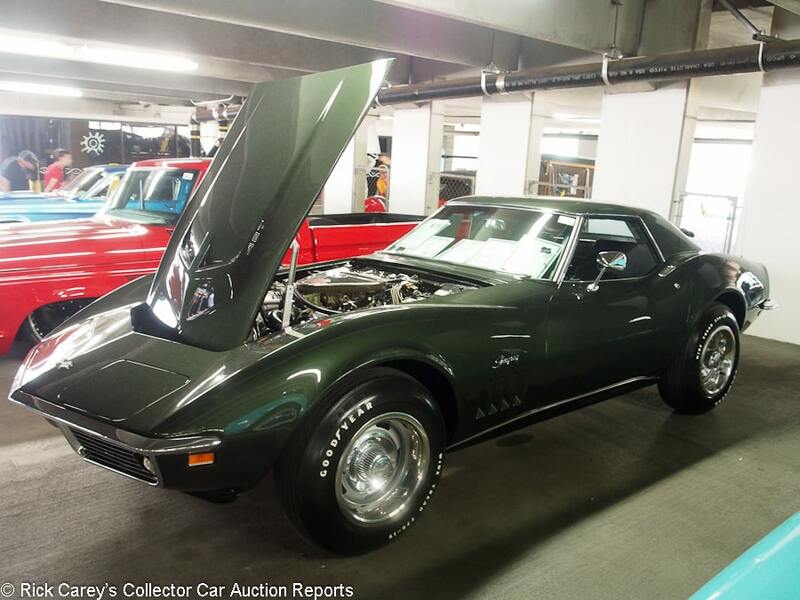 – Offered by Auctions America at Ft. Lauderdale ten weeks ago with a reported high bid of $270,000, the consignor may be holding out unreasonably waiting for someone to show up who thinks it is worth more than this. Hope springs eternal, but the car isn’t getting any better, nor will it until someone gives it a fresh engine-out (and expensive) service. 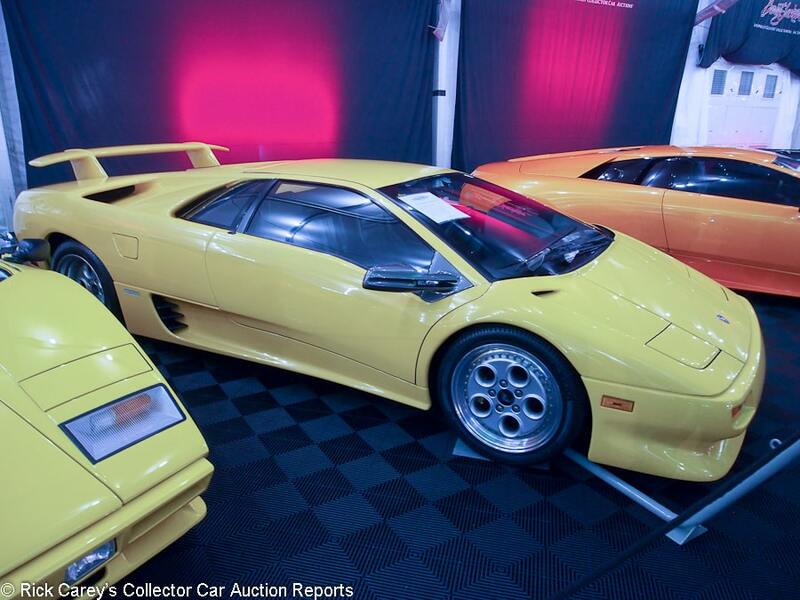 Lot # 661 1991 Lamborghini Diablo Coupe; S/N ZA9DU07P7MLA12300; Yellow, Grey mirrors/Black leather; Unrestored original, 2 condition; Not sold at Hammer bid of $159,500. With Reserve. 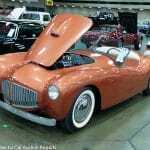 – OZ Racing wheels, P Zero tires, cassette stereo, power windows, air conditioning. – 11,832 km. Some scratches on the left rear wheel and light cracks in the center cap. Otherwise looks great inside and out. An almost like new early Diablo stored since 2003. 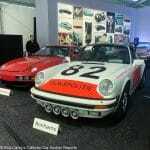 – Offered at Kissimmee in January where the reported bid was $130,000, then at Auctions America’s Ft. Lauderdale auction in April with a bid of $147,500. The consignor has aspirations and the way things are going they might be met the next time it crosses the block. Lot # 720 2007 Lamborghini Gallardo Spyder; S/N ZHWGU22T37LA05525; Black/Black leather; Black cloth top; Unrestored original, 2 condition; Hammered Sold at $125,000 plus commission of 10.00%; Final Price $137,500. With Reserve. – Silver painted modular wheels, yellow calipers, multimedia entertainment, front axle lift. – 3,300 miles, essentially like new. – Miles are important on Gallardos but even 3,300 miles don’t make this Gallardo worth the result here, a generous price by at least $15,000. 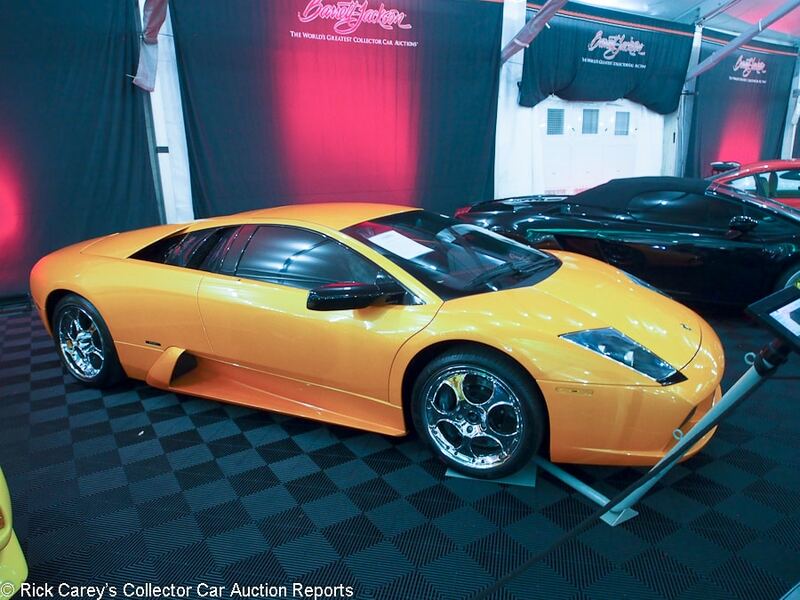 Lot # 702 2002 Lamborghini Murcielago Coupe; S/N ZA9BC10U42LA12185; Atlas Orange/Black leather; Unrestored original, 2 condition; Not sold at Hammer bid of $154,000. With Reserve. – Chrome wheels. – Very good paint, chrome and interior. The underbody is nearly like new. The driver’s seat cushion is lightly stretched. Represented as having a clear CarFax and AutoCheck and documented with the original window sticker but no representation of mileage. – Sold for $103,350 at Mecum’s Houston auction in 2012, the proliferation of fairly recent supercars at auction would seem to create a supply and demand issue that the consignor didn’t consider in declining this reported high bid. 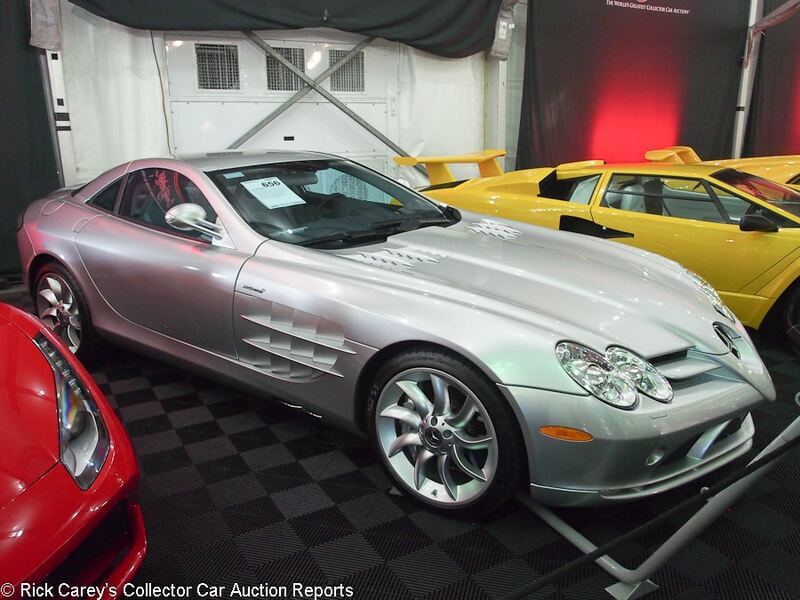 Lot # 656 2006 Mercedes-Benz SLR McLaren Coupe; S/N WDDAJ76F26M000854; Silver/Grey; Unrestored original, 2- condition; Hammered Sold at $180,000 plus commission of 10.00%; Final Price $198,000. With Reserve. – Power steering, power brakes, power windows, air conditioning. – The underbody is a little dirty but the rest of the car is like new. – One of about 1,500 built by McLaren for Mercedes-Benz and still an arresting presence both when it drives by and especially for the driver. This is a wholesale result. 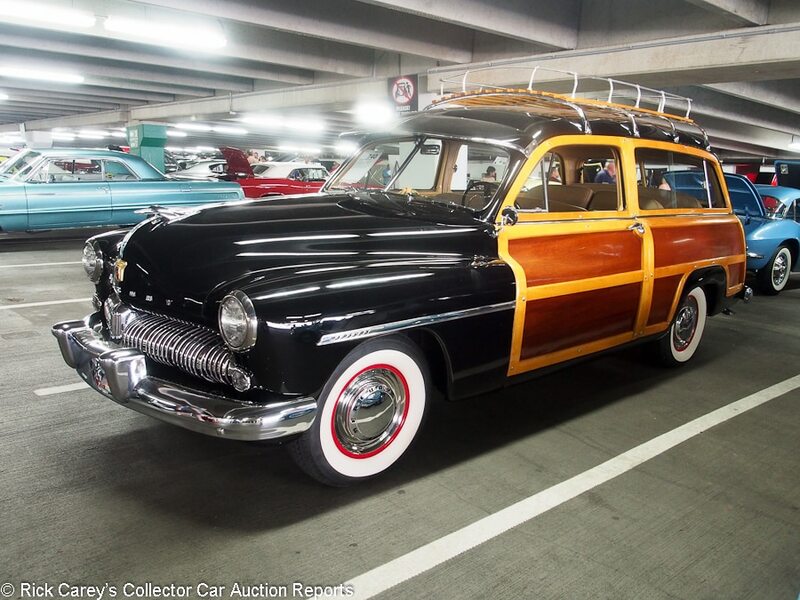 Lot # 740 1949 Mercury 9CM Station Wagon; S/N 9CM262504; Black/Tan vinyl; Cosmetic restoration, 3+ condition; Hammered Sold at $73,000 plus commission of 10.00%; Final Price $80,300. No Reserve. – Roof rack, wheel covers, wide whitewalls, windshield visor, grille guard, clock, no radio, three-row seating, enclosed rear spare, trailer hitch, 3-speed, Fenton headers, 12-volt converted with an alternator. – Sound older paint, chrome and interior. Sound wood with some waterstained joints and varnish loss. The underbody is dry, with old undercoat. An attractive, sound driver. – A popular car, this Mercury was sold back in 2011 at Russo and Steele in Scottsdale for $49,500 showing just 123 fewer miles on its odometer than it showed today. Worldwide sold it in Houston sixteen months later for $63,800, then at Dallas two months ago for $42,900. Today’s result is a triumph, nearly double the hammer bid just a few weeks ago in Dallas. Station wagons are a popular category, but not as popular as this result indicates. 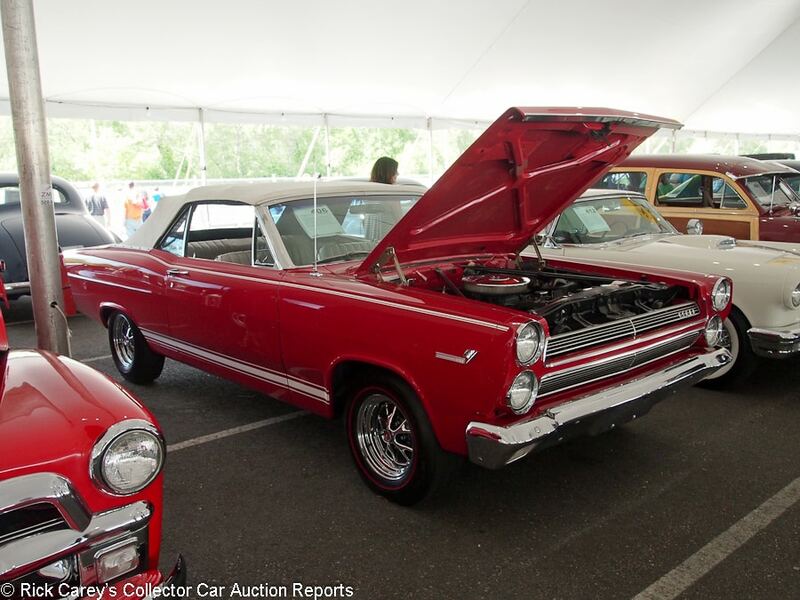 Lot # 406 1966 Mercury Cyclone GT Convertible; S/N 6H28S605711; Cardinal Red/White vinyl; White vinyl top; Older restoration, 3 condition; Hammered Sold at $32,000 plus commission of 10.00%; Final Price $35,200. No Reserve. – 390/335hp, automatic, power steering, no power brakes (despite what the car card says), chrome rim Magnum wheels, buckets and console, pushbutton radio, red line tires. – The paint is very good with only a few very minor scratches. Striping is starting to peel off in a couple places. Brightwork looks good with some minor scratching throughout and pitting on the rear sail panel. Convertible top is showing some wear and grime. Engine compartment is clean with some signs of use and paint missing in a few spots up top but is aged, surface rusted and road grimy underneath. Underneath looks good with some minor surface rust showing on the frame rails. Interior looks very good with wear on the driver’s door panel near armrest. A lightly aged older restoration. – Sold for $43,460 at Mecum Indy in 2010, then for $31,900 at the same venue a month ago. The buyer paid a little more here, but still less than it brought seven years ago and got full value for the money, even without power brakes. 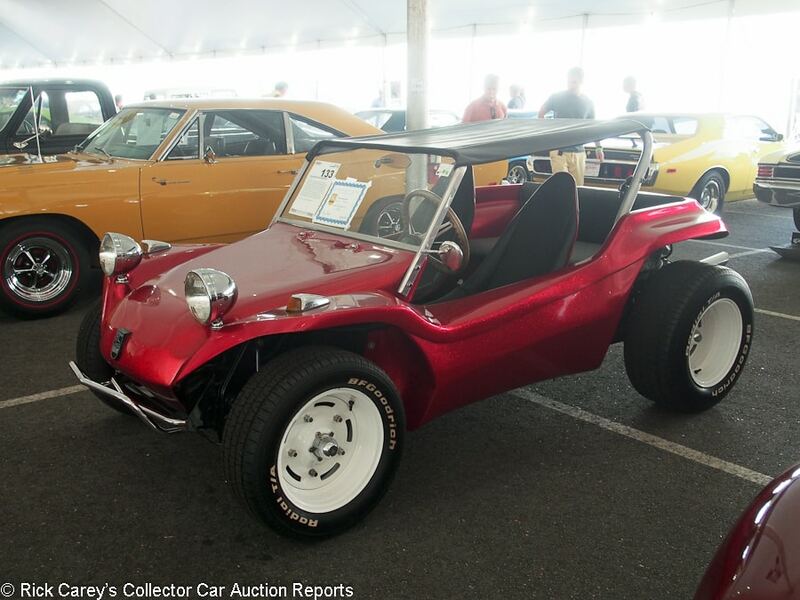 Lot # 133 1959 Meyers Manx Dune Buggy; S/N 3688141; Metalflake Red/Grey vinyl; Black vinyl top; Enthusiast restoration, 3+ condition; Hammered Sold at $19,500 plus commission of 10.00%; Final Price $21,450. No Reserve. – Rear seating, White steel wheels, Radial T/A tires, woodrim steering wheel, authenticated by Bruce Meyers. – Good metalflake paint, chrome and seat covers. Neat, orderly engine with a Solex carb. Chassis is road dirty but not neglected. A sorted and presentable example from the originator of the dune buggy concept. 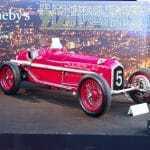 – This Meyers Manx got abundant attention in the preview, and not entirely on account of its bright metalflake red finish. It will be hugely enjoyable and is every bit as much fun as, and even more rare than, a Fiat Jolly. For something like half the price of a Jolly it has value for the new owner and will look great on the dunes of Cape Cod. 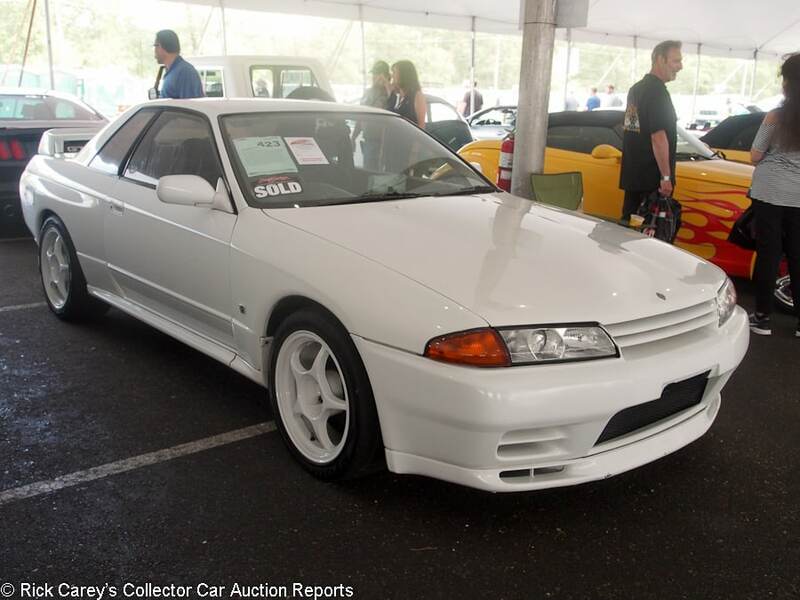 Lot # 423 1991 Nissan Skyline GTR 2-Dr. Sedan; S/N BNR32212836; White/Grey cloth; Unrestored original, 3+ condition; Hammered Sold at $27,000 plus commission of 10.00%; Final Price $29,700. No Reserve. – RHD. 2.6/276hp, twin turbos, 5-speed, all wheel drive, white alloy wheels, Brembo brakes, stereo, navigation, Apex system monitor, Nexen tires. – Very good paint, lightly soiled interior. Clean, original underbody looks much more fresh than the 135,835km showing on the odometer. – Skyline GTRs are turning up everywhere recently now they’re 25 years old and exempt from import restrictions. Some have brought exuberant money but this transaction doesn’t reflect that and must be a disappointment to the importer, Tomonaka Corporation in Las Vegas. It should immediately go on a Reliable truck and head west where the Asian import scene is more active. 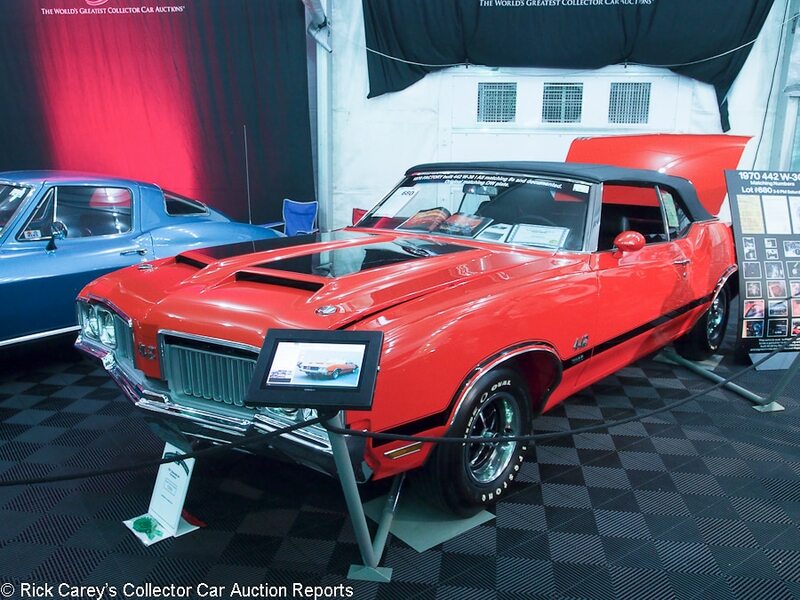 Lot # 680 1970 Oldsmobile 4-4-2 W30 Convertible; S/N 344670M369764; Rally Red, Black hood stripes/Black vinyl; Black vinyl top; Recent restoration, 2 condition; Hammered Sold at $120,000 plus commission of 10.00%; Final Price $132,000. With Reserve. – 455/370hp, automatic, 3.9 limited slip, power steering, brakes and windows, His’n’Hers Hurst shifter, AM-FM, power seats, tilt steering column, oil cooler, SS wheels, Wide Oval tires. – Very good paint, bright chrome, pristine interior. The engine compartment and the underbody are like new. Other than a little dust on the crossmember under the engine it is impossible to fault. Represented as “matching and correct numbers throughout” with 94,353 miles from new. – This is a significant 4-4-2, done everywhere to high standards and bound to be a great summer cruiser and show car. It brought a really moderate price for its specifications, equipment and the quality of its restoration and could have brought $20-30,000 more without negative comment. A good value in a great 4-4-2 convertible. 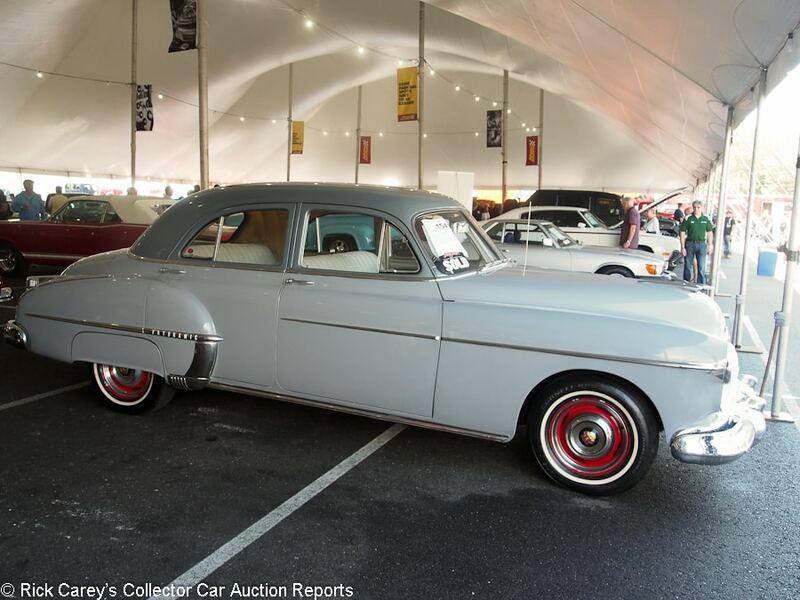 Lot # 154 1950 Oldsmobile Rocket 88 4-Dr. Sedan; S/N 508L1114; Grey, Dark Grey roof/Grey cloth; Enthusiast restoration, 3- condition; Hammered Sold at $8,500 plus commission of 10.00%; Final Price $9,350. No Reserve. – 303/135hp, automatic, Red steel wheels, hubcaps, trim rings, narrow whitewalls, skirts, pushbutton radio. – Painted assembled with bad masking and worse preparation. Good major chrome, pitted windwing frames and door handles. Old door seals. Cruddy, dry, unrestored underbody. Two family owned from new, superficially cosmetically restored. – It would have been better if this Olds had gotten a decent paint job, or just been left with its original paint, but that’s not what happened. It might be used as is, but will really benefit from a decent repaint, particularly if it is color changed from this dull, monotonous grey. At this price spending very much money on it becomes a labor of love, because it will never be returned when it’s resold. 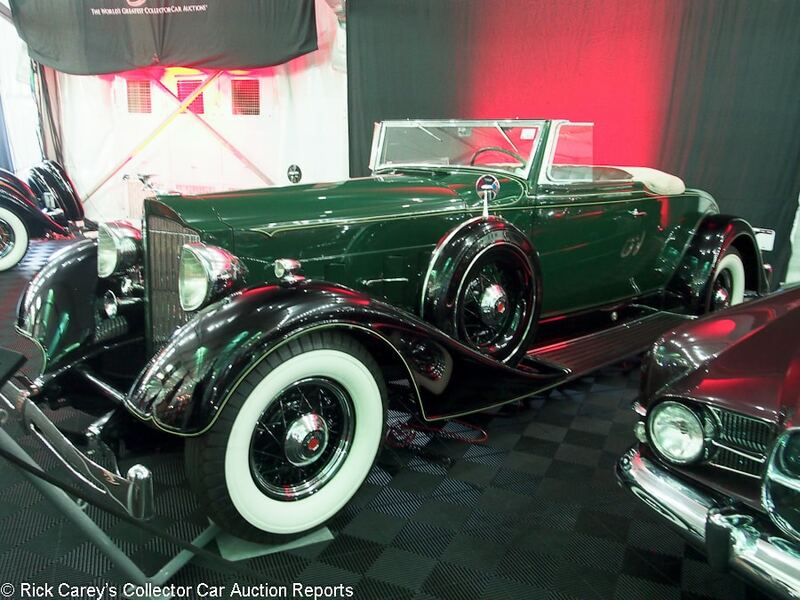 Lot # 698 1934 Packard 1104 Super 8 Roadster; S/N 753642; Dark Green, Black fenders/Brown leather; Beige cloth top; Concours restoration, 1- condition; Hammered Sold at $180,000 plus commission of 10.00%; Final Price $198,000. With Reserve. – Black wire wheels, wide whitewalls, trim rings, Depress Beam headlights, dual enclosed sidemounts with mirrors, wind wings, luggage rack, rumble seat, Ride Control. – Still nearly concours ready. 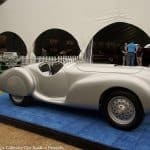 – Described at the auction as having “undergone a recent restoration”, it is in fact pretty much the same car it was back in 2005, a dozen years ago, when it crossed the block at the Atlantic City auction at the Borgata. It was sold by RM at Meadow Brook in 2010 for $154,000. Packard gurus get excited when talking about the ’34 Packards; they have delightful performance and handling together with real Classic design. The combination is tantalizing, making this a responsible result for this very good example with its well preserved older restoration. It just looks “recent”. 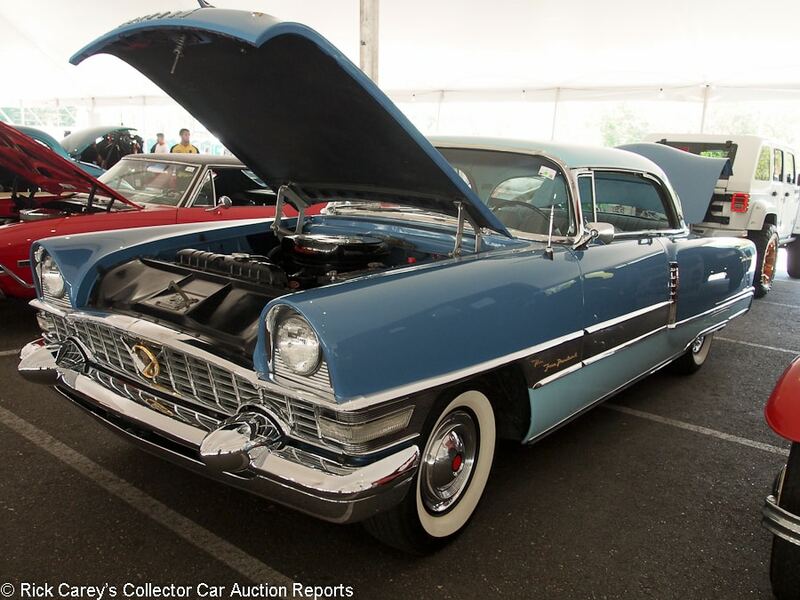 Lot # 102 1955 Packard 400 2-Dr. Hardtop; S/N 55876182; Blue, Light Blue roof and side accent/Blue vinyl, Grey cloth; Cosmetic restoration, 3 condition; Hammered Sold at $25,000 plus commission of 10.00%; Final Price $27,500. No Reserve. – 352/260hp, automatic, power steering, power windows, power bench seat, wheel covers, wide whitewalls, skirts, WonderBar radio, heater. – Good older paint, chrome and interior. The doors fit very well. The engine compartment has been superficially cosmetically redone while the chassis and underbody have gotten cleaned up and given some chassis black paint. It makes a good first impression. – Caribbean convertibles are commonplace compared with this 400 Hardtop, a southern California car until 1996, which is in good and surprisingly original condition. It was sold a month ago at Mecum’s Indianapolis auction for $16,500 and turned over here for a nice profit. This result places a high value on its rarity and preservation and is generous for its condition. 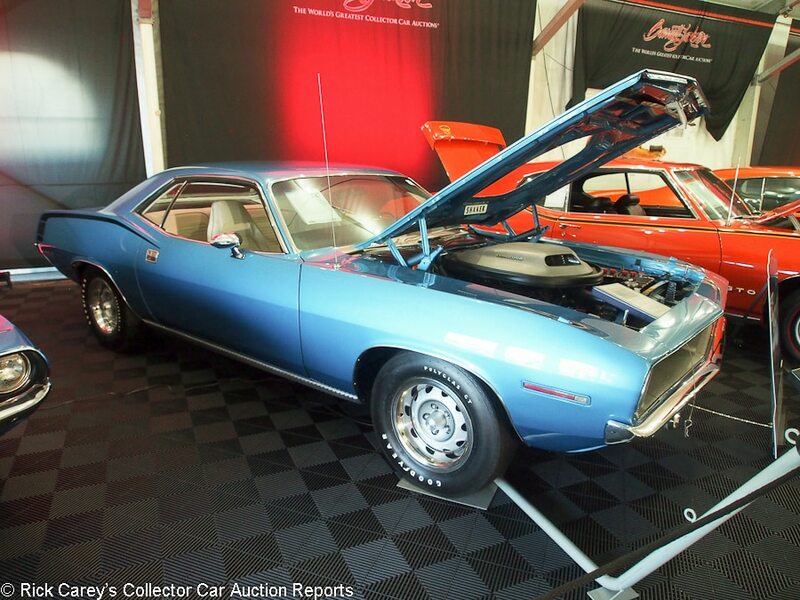 Lot # 670 1970 Plymouth ‘Cuda Hemi 2-Dr. Hardtop; S/N BS23R0B242053; Blue/White vinyl; Older restoration, 2 condition; Hammered Sold at $185,000 plus commission of 10.00%; Final Price $203,500. With Reserve. – 426/425hp Hemi, 4-speed, power brakes, Rallye wheels, trim rings, Polyglas GT tires, pushbutton radio, shaker hood, no console, Hurst shifter. – Date coded replacement engine. Very good paint, chrome and interior. Flush panel fits, even gaps. The clean, orderly engine compartment has a little oily grime on the crossmember but is otherwise like new. The underbody is like new. Documented with two broadcast sheets and the original window sticker. – While the honestly disclosed replacement engine limits this ‘Cuda’s value it is perhaps less a knock on it than with some other cars. These things were brutally raced when new and while the Hemi is strong it is not immortal. The result here makes perfect sense and the new owner can be proud of the car and the price paid for it. 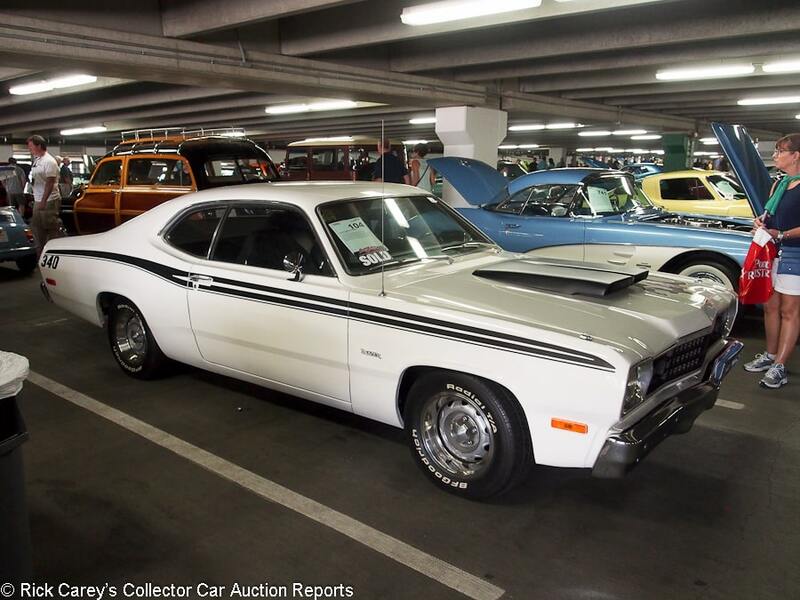 Lot # 104 1973 Plymouth Duster 2-Dr. Sedan; S/N VS29H3B432264; White, Black scoop and side stripes/Black vinyl; Enthusiast restoration, 3- condition; Hammered Sold at $16,500 plus commission of 10.00%; Final Price $18,150. No Reserve. – 340/240hp, 4-speed, Hurst shifter, bench seat, hood scoop, power front disc brakes, Rally wheels with trim rings, Radial T/A tires, cassette stereo. – Repainted assembled with sloppy masking. Sound upholstery, foggy gauges, scraped dashboard. Dirt and dead bugs at the bottom of the windshield. Dry chassis and underbody with old undercoat. An unusual car in driver condition. – It’s a better car than the treatment it’s received, but that and the moderate price it brought leave plenty of opportunity for a new owner to spiff it up. It’s worth what was paid for it, is a great way to get into collecting with a modest investment and still has a driveline and equipment that are interesting. 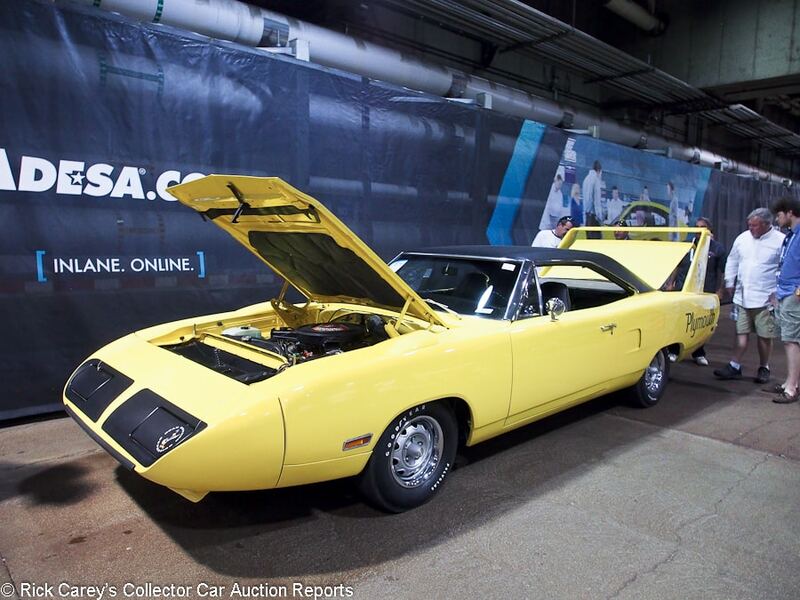 Lot # 671 1970 Plymouth Road Runner Superbird 2-Dr. Hardtop; S/N RM23U0A178682; Yellow, Black vinyl roof/Black vinyl; Older restoration, 3+ condition; Hammered Sold at $105,000 plus commission of 10.00%; Final Price $115,500. No Reserve. – 440/375hp Magnum, automatic, power steering, power front disc brakes, Rally wheels, Polyglas tires, high back bucket seats, console, gauges. – An older restoration with very good paint, good chrome and interior. Some filler in the lower body and a small rust blister at the lower rear corner of the driver’s door. The underbody is tidy and showing age, – Sold at Mecum Kissimmee in 2013 for $96,460, this Superbird brought $118,250 at Kissimmee this January. The odometer has been stuck at exactly the same 89,488 miles since 2013. What was missing here was the claim made in Kissimmee that the engine was the numbers-matching 440 Magnum. Having sold twice in a month at nearly the same amount it is reasonable to state this is what it’s worth even if the transaction costs hammered the seller here. 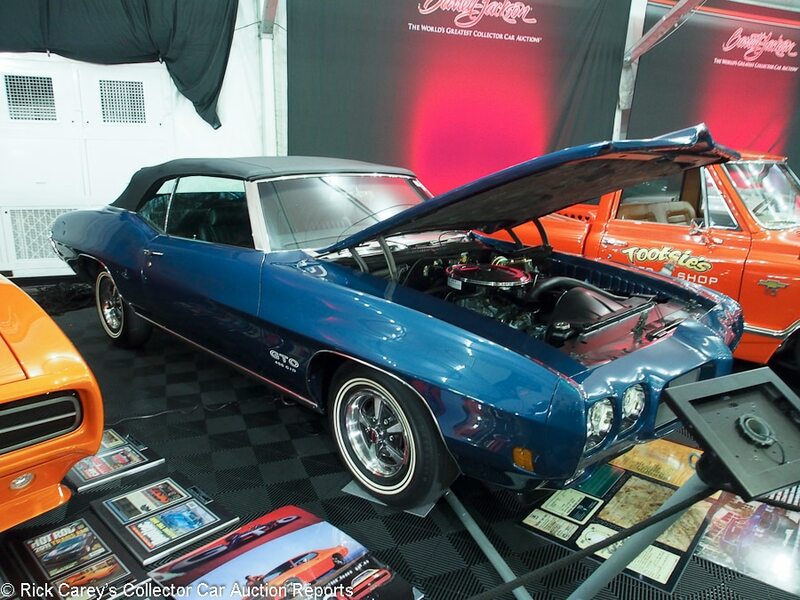 Lot # 710 1970 Pontiac GTO Convertible; S/N 242670P177509; Engine # WA; Lucerne Blue/Black vinyl; Black vinyl top; Recent restoration, 2+ condition; Hammered Sold at $117,000 plus commission of 10.00%; Final Price $128,700. With Reserve. – 455/360hp, 4-speed, Hurst shifter, power steering, power brakes, buckets and console, AM-FM, Rally II wheels, dual line narrow whitewalls, 3.31 Safe-T-Track, build sheet, Sport steering wheel, build sheet(s), Protect-o-Plate and original invoice documented. – Freshly restored and better than new everywhere. The engine’s WA suffix indicates it’s a Ram Air IV but the seller doesn’t claim that, nor is there any representation that this is the original engine. – Those qualifications are significant but pale beside the caliber of the restoration and the magnificent equipment list. The price it brought is Ram Air IV money, however. 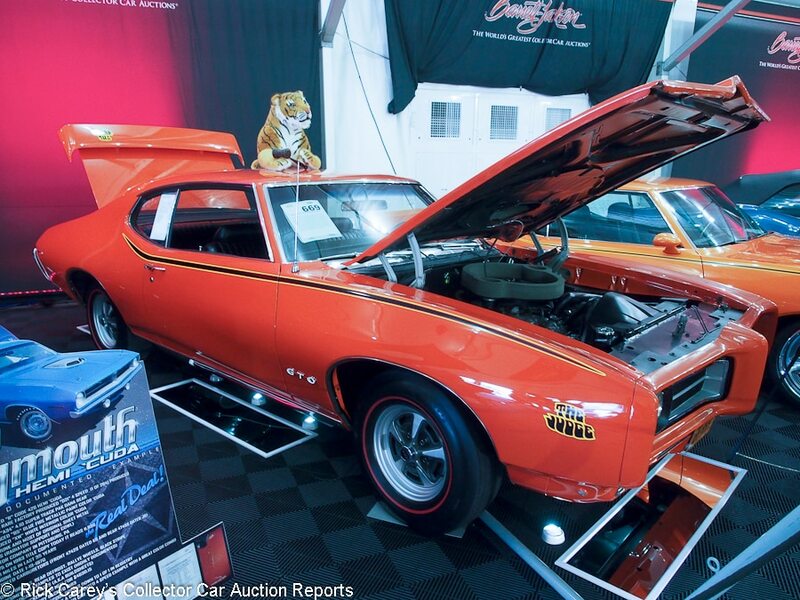 Lot # 669 1970 Pontiac GTO Judge 2-Dr. Hardtop; S/N 242379B176476; Orange/Black vinyl; Recent restoration, 2+ condition; Hammered Sold at $130,000 plus commission of 10.00%; Final Price $143,000. With Reserve. – 455/370hp Ram Air IV, 4-speed, Hurst T-handle shifter, 3.90 Safe-T-Track, pushbutton radio, painted rim Rally II wheels, red line tires, bench seat with headrests, power steering, gauges, no power brakes. – Excellent paint, chrome and interior. Engine compartment and underbody are like new. No engine number stamping on the block. PHS documented. – Once in a while lightning strikes on the block at a Barrett-Jackson auction and this is one of them. This car sold for $84,800 at Mecum’s 2012 Indianapolis auction, then for $79,200 at Mecum Chicago in 2015 and most recently for $78,100 ($71,000 hammer) at Indy a month ago, thereby bringing nearly double in just four weeks. It is a beautiful restoration but the lack of a block stamping, or of any representation of the engine’s originality rather than just saying it was built with an RA IV is troubling and makes the result at the Spring Classic much more appropriate than the generous price it brought here. 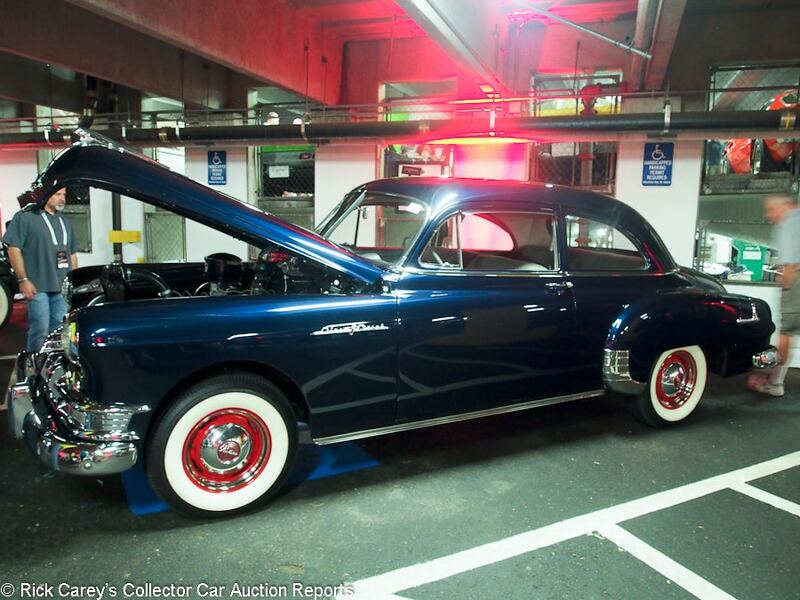 Lot # 348 1950 Pontiac Streamliner 8 2-Dr. Sedan; S/N A8TS1176; Dark Blue/Beige cloth; Recent restoration, 2 condition; Hammered Sold at $30,000 plus commission of 10.00%; Final Price $33,000. No Reserve. – 286/108hp, 3-speed, no radio, heater, Red wheels with hubcaps and trim rings, wide whitewalls, turn signals, side window visors. – Very good paint, chrome and interior. The chassis and underbody are like new. A marvelous restoration of a car that doesn’t usually get done anywhere close to this well. 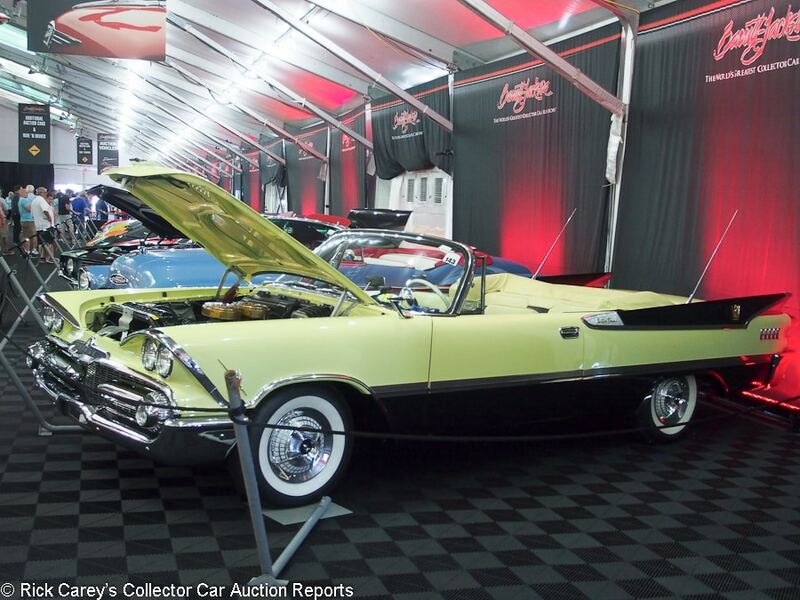 – The Mohegan Sun bidders responded to the quality of this Pontiac’s restoration with a highly impressive price that should have Pontiac owners around the planet rushing to restore their Chieftains and Streamliners. The new owner paid for the best, and got it. 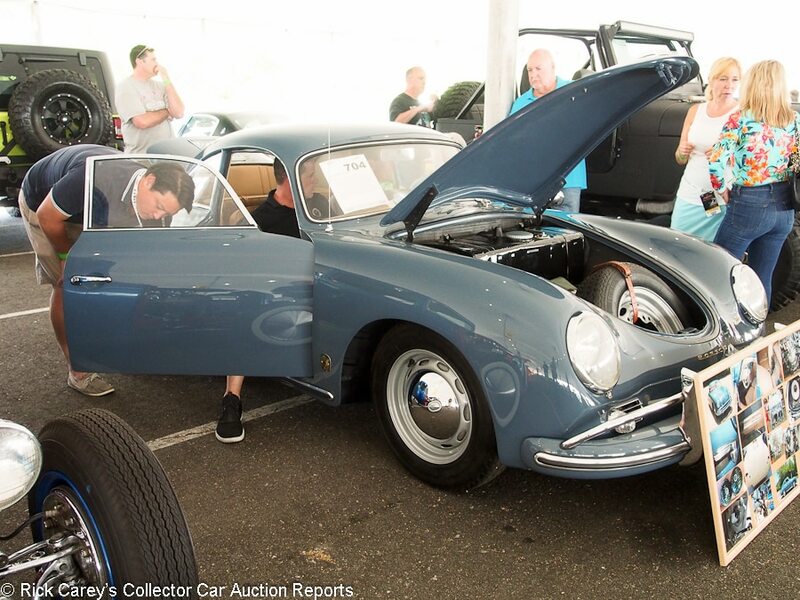 Lot # 704 1959 Porsche 356A Coupe, Body by Reutter; S/N 107429; Engine # P73998; Aquamarine Blue/Beige leather; Recent restoration, 2 condition; Hammered Sold at $90,000 plus commission of 10.00%; Final Price $99,000. No Reserve. – Blaupunkt multi-band radio, painted wheels, hubcaps, Vredestein tires, bumper overriders, tools, spare, jack. – Represented as the matching numbers engine. Very good paint, chrome, upholstery. Crisp, sharp gauges. Underbody and engine were done like new and show more age and use than indicated by the claimed 300 shakedown miles. – If you came to B-J Northeast looking for a 356 Porsche this was your choice and its Aquamarine Blue paint was somewhere between that and Meissen Blue (closer to the latter.) Attractively restored, but less than fresh, it brought a modest price despite having no competition among prospective 356 Coupe buyers. 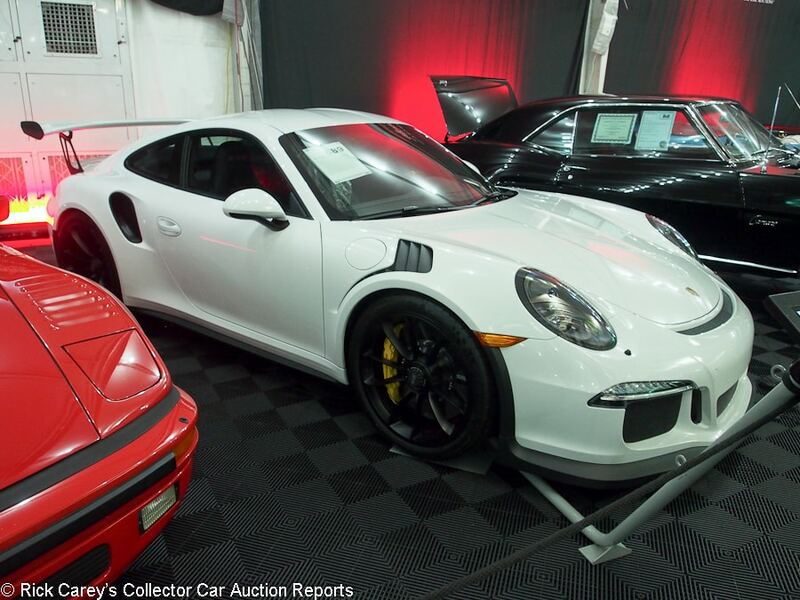 Lot # 689 2016 Porsche 911 GT3 RS Coupe; S/N WP0AF2A94GS193215; White/Black Alcantara, Orange stitching; Unrestored original, 2 condition; Not sold at Hammer bid of $247,500. With Reserve. – Matte black alloy wheels, Yellow calipers, bi-xenon headlights, front axle life, ceramic composite brakes, Sport Chrono, extended range tank, Light Design package, 18-way sport seats, smoking package, white instruments, nav system, Porsche car cover. – 17 miles from new. – Even with all the options the reported high bid is close to MSRP, a price the consignor should have given more serious consideration. There is no shortage of delivery mileage 911 GT3 RSs in the market. 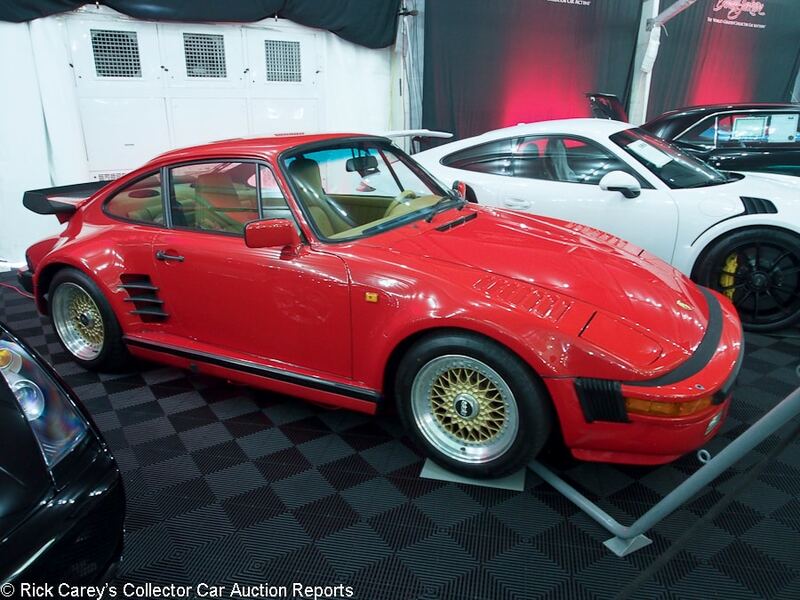 Lot # 713 1986 Porsche 930 Turbo Coupe; S/N WP0ZZZ93ZGS000360; Guards Red/Champagne leather; Unrestored original, 3+ condition; Hammered Sold at $141,000 plus commission of 10.00%; Final Price $155,100. With Reserve. – Slant nose body, power sunroof, power windows, sport seats, Alpine cassette stereo, air conditioning BBS wheels, Dunlop tires. – Represented as a two owner original car with 15,177 miles, a clean CarFax and looks like it. Very good paint. The front seats are lightly creased from use. The underbody is original and shows its age. – Softening in 930 Turbo prices is apparent in this result however this much money would, with some negotiation, buy a new GT3. It doesn’t make much sense, but that’s the way 930 Turbos are revered by those for whom 300 suddenly released turbocharged horsepower are valued. Lot # 665.1 1966 Shelby Mustang GT350H Fastback; S/N SFM6S1025; Ivy Green, Gold stripes/Black vinyl; Recent restoration, 2+ condition; Hammered Sold at $200,000 plus commission of 10.00%; Final Price $220,000. With Reserve. – 289/306hp, automatic, pushbutton radio, Shelby Magnum Hertz logo wheels, Polyglas tires, dashtop tach. – Freshly restored, excellent cosmetics, better than new under the hood and under the car. Represented to have 72,402 original miles and restored in 2010. 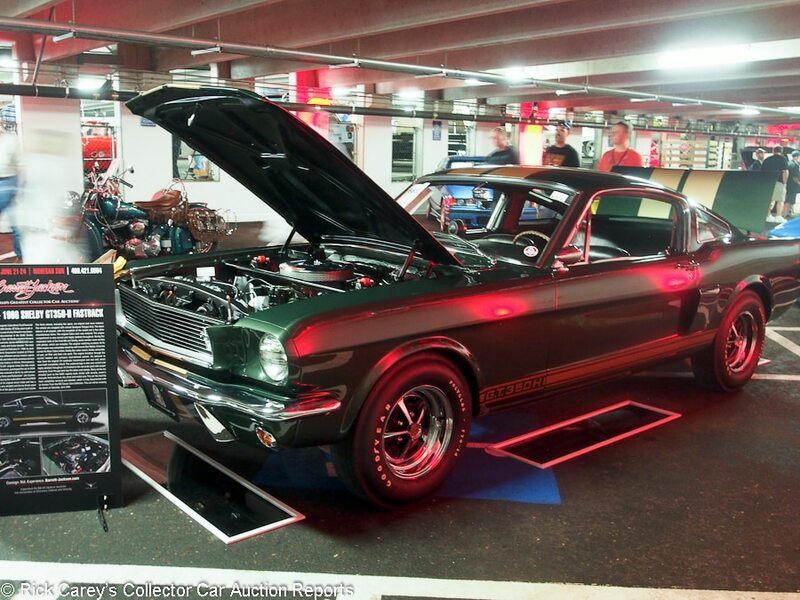 Documented ownership history, one of 59 GT350H built in Ivy Green. – Bought moderately for a GT350H in such marvelous condition and in such a rare color. 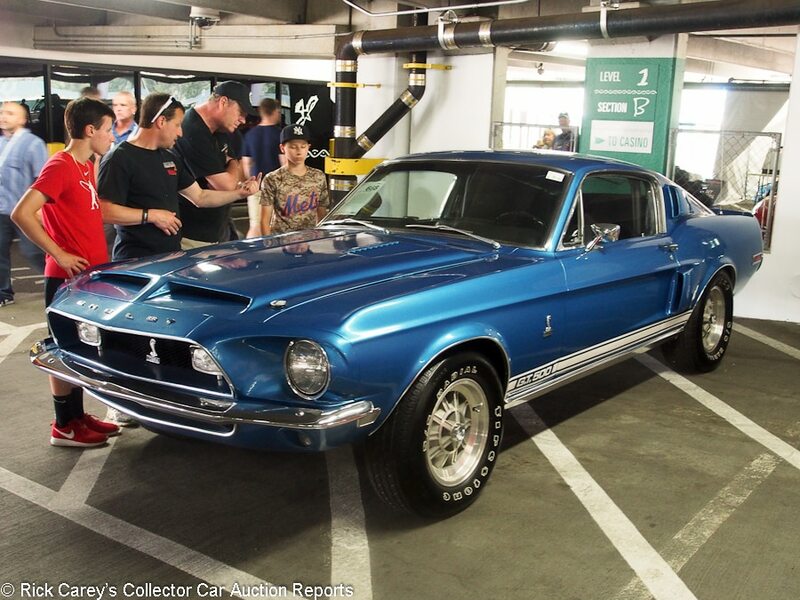 Lot # 668 1968 Shelby Mustang GT500 Fastback; S/N 8T02S126905-00698; Acapulco Blue/Black vinyl; Visually maintained, largely original, 3- condition; Hammered Sold at $80,000 plus commission of 10.00%; Final Price $88,000. No Reserve. 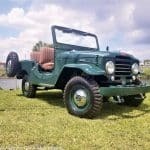 – 428/335hp, automatic, power steering, power brakes, rear window slats, pushbutton radio, Shelby 10-spoke wheels, Firestone radial tires, grille-mounted rectangular driving lights. – Represented as the original engine and transmission and 75,207 miles from new. It has an exceptionally poor repaint over flawed old paint. Bubbles, ripples, cracks and masking misses. Dirty old undercoat in the wheel wells. Pulled seam in the driver’s seat cushion. Represented as two owners from new and stored for seventeen years. It would have been better if it had never been painted. – Even starting from this modest price it is going to be hard to make a silk purse out of this sow’s ear without going seriously underwater in the process. It needs literally everything and even a single bidding increment over the successful bid here would have been too much. 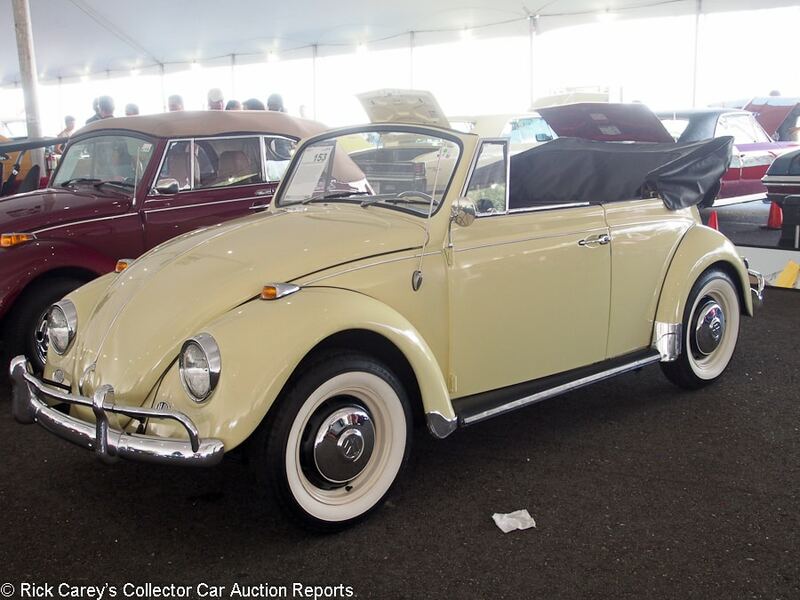 Lot # 153 1967 Volkswagen Beetle Convertible; S/N 157657598; Engine # AH288188; Light Yellow/Black vinyl; Black vinyl top; Visually maintained, largely original, 3 condition; Hammered Sold at $12,000 plus commission of 10.00%; Final Price $13,200. No Reserve. – Sanyo cassette stereo, bumper overriders, backup lights. – Represented as 95,502 miles from new. Repainted over chips and cracks at the windshield post. Dry, original underbody, orderly engine compartment. Sound upholstery. Rusted top frame. Clear gauges. A sound driver for the coming season. – The paint job is described as 30 years old and back then when this Beetle was still a teenager the caliber of this work is about what would have been appropriate. The bidders liked it more than the somewhat better looking example (but with chrome reversed wheels) that preceded it across the block. This is a full retail price. 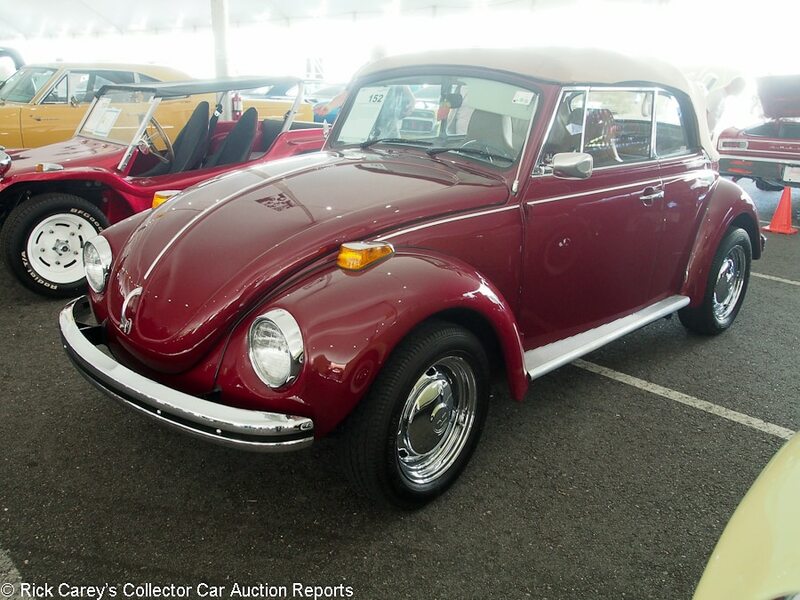 Lot # 152 1972 Volkswagen Super Beetle Convertible; S/N 1522360414; Maroon/Tan vinyl; Tan cloth top; Older restoration, 3+ condition; Hammered Sold at $9,000 plus commission of 10.00%; Final Price $9,900. No Reserve. – Clarion CD and cassette stereo, aluminum running boards, chrome reversed wheels, blackwall radial tires. – Unnumbered engine case. Very good paint, interior, top and chrome except for a small peeling area on the rear bumper. Neat, orderly engine compartment. The underbody was done like new and now shows some miles appropriate to the 2,625 miles on the odometer. – For a Beetle cabriolet presented in this condition the result is surprisingly modest although it must be said that the reversed wheels are a little pretentious. It is a particularly good value when contrasted with the poorly repainted ’67 Beetle Cabriolet that sold right after it for $12,000 hammer. Always terrific reporting from Rick! His energy, extensive records and knowledge are unmatched in the field.